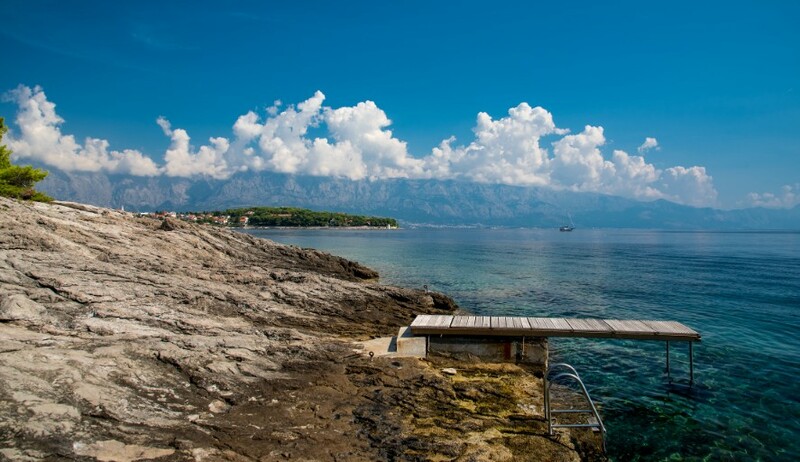 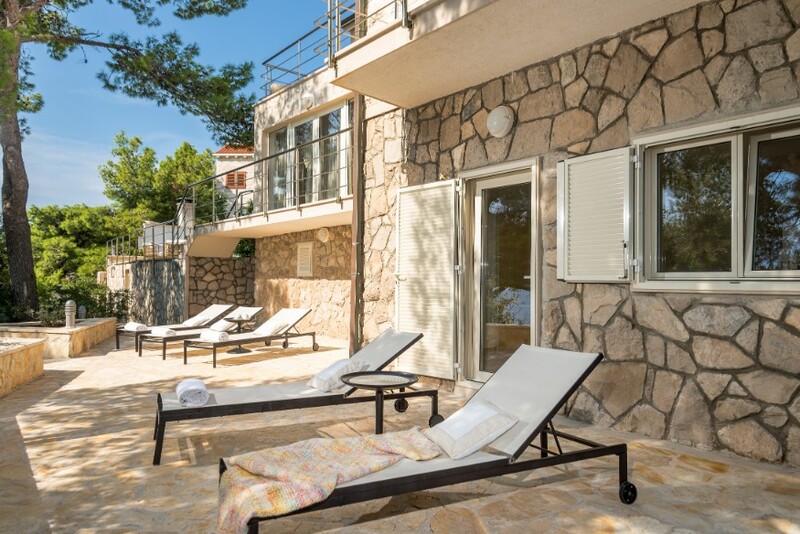 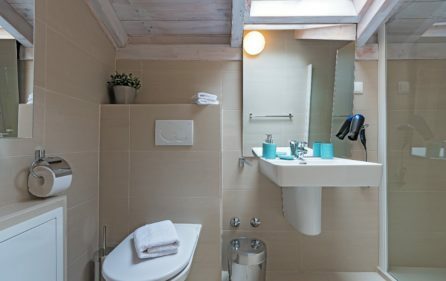 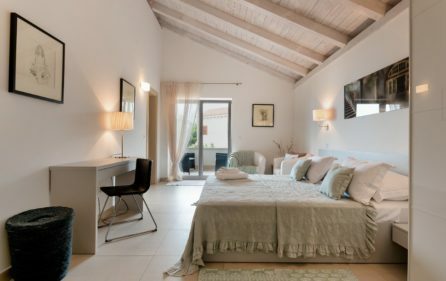 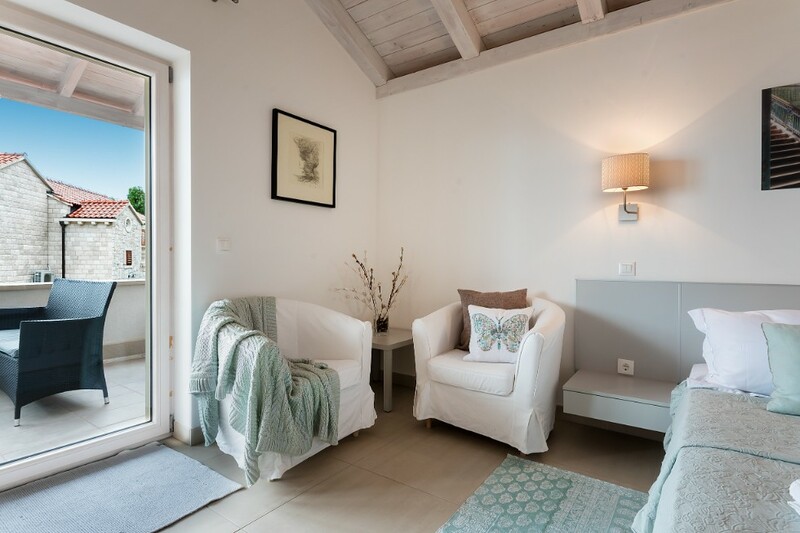 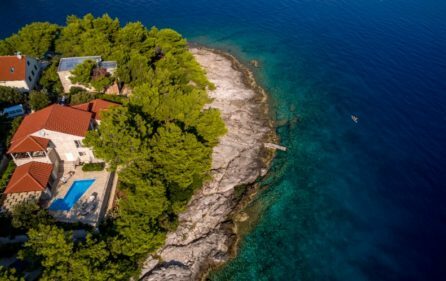 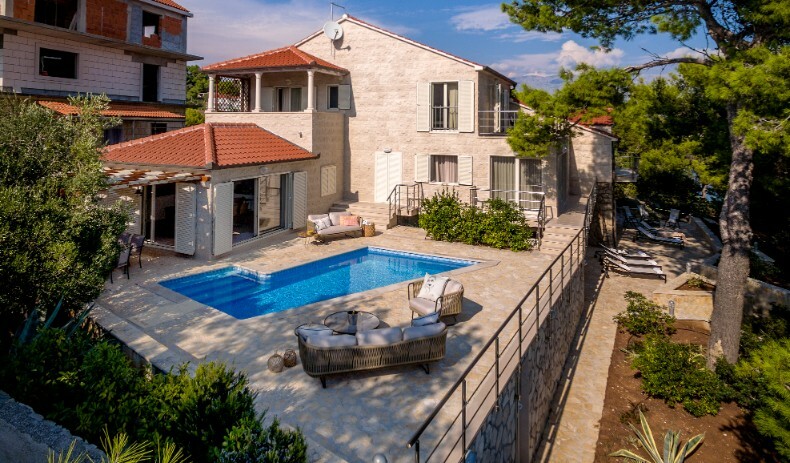 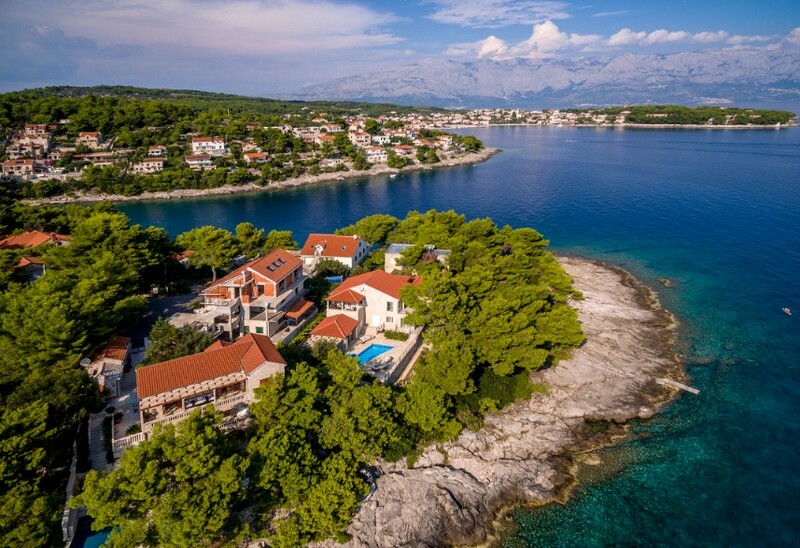 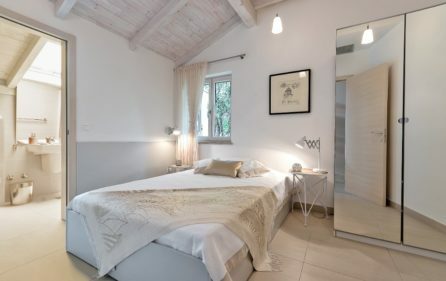 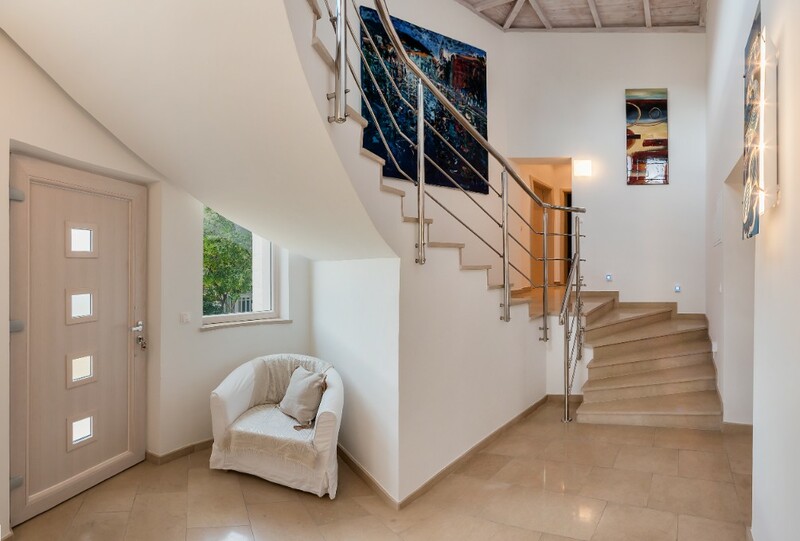 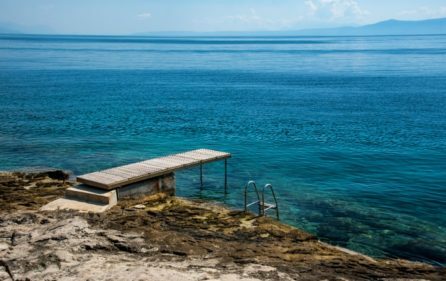 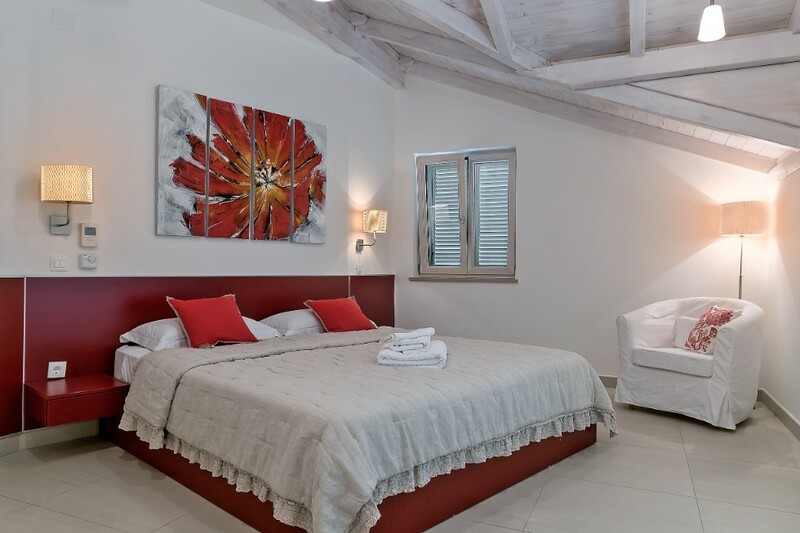 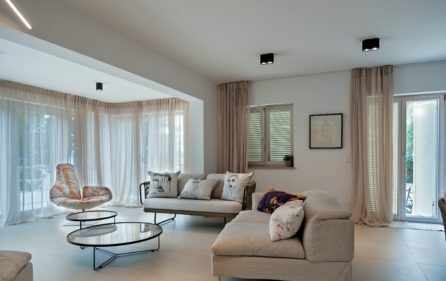 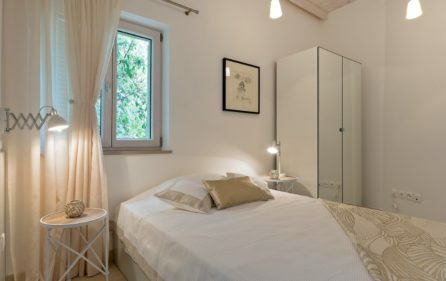 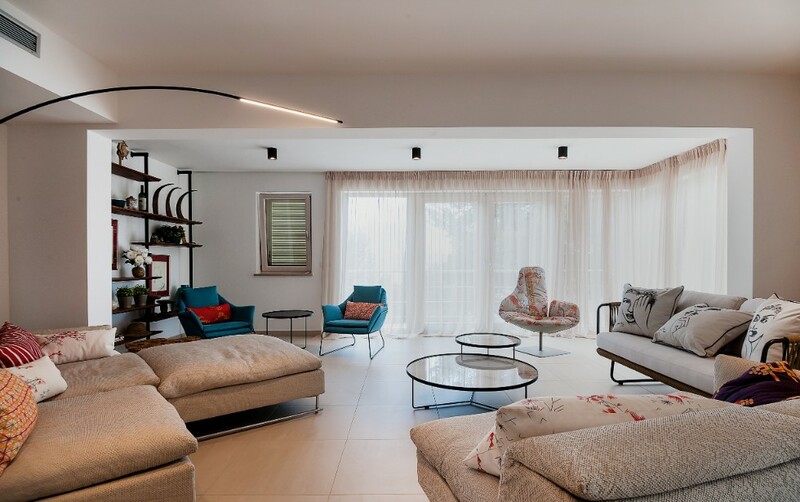 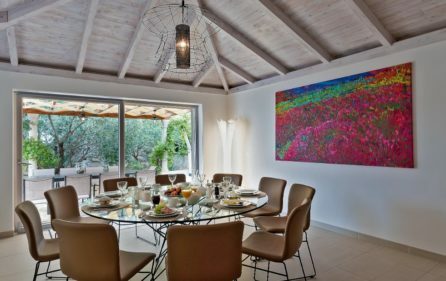 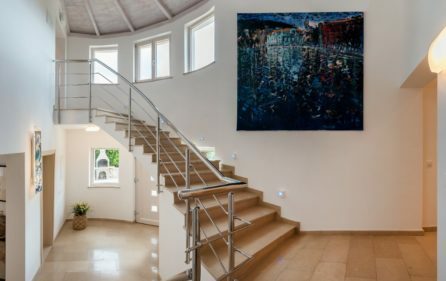 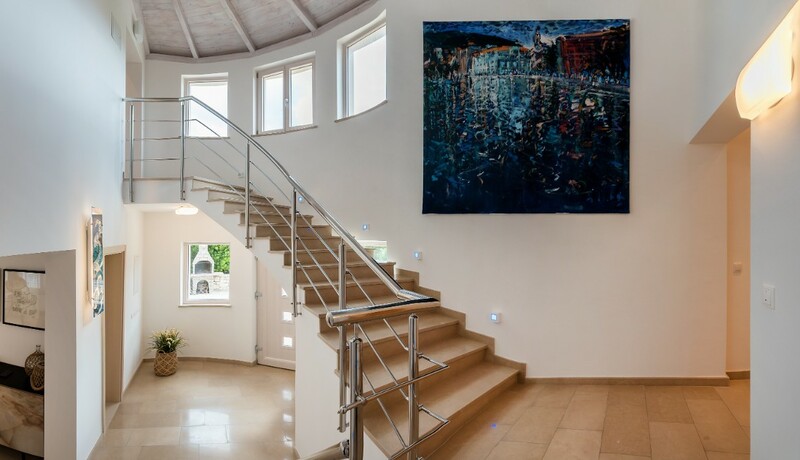 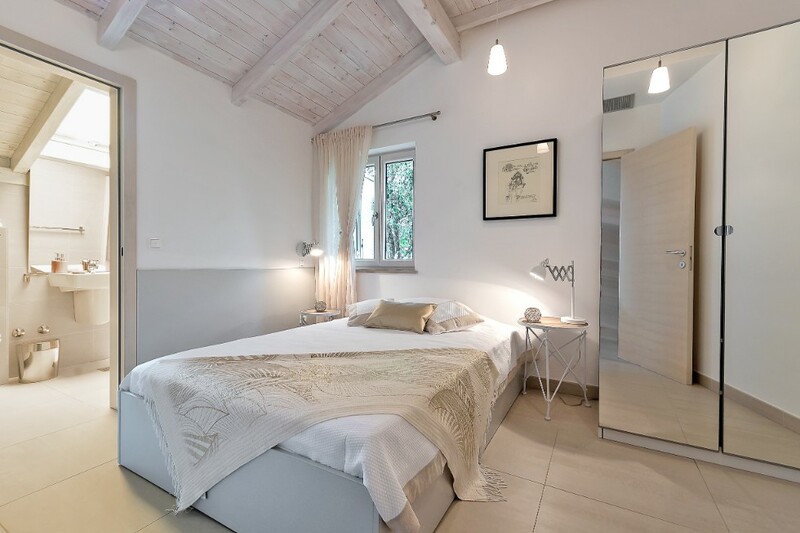 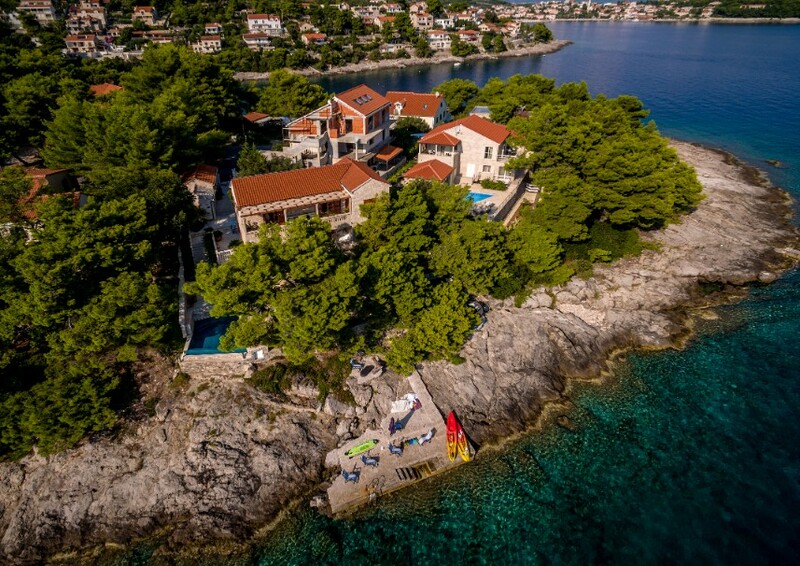 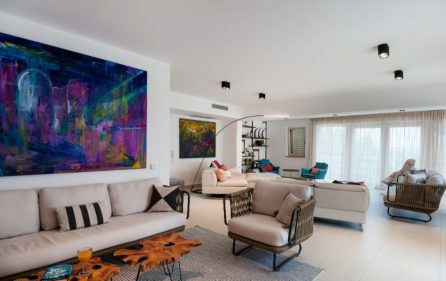 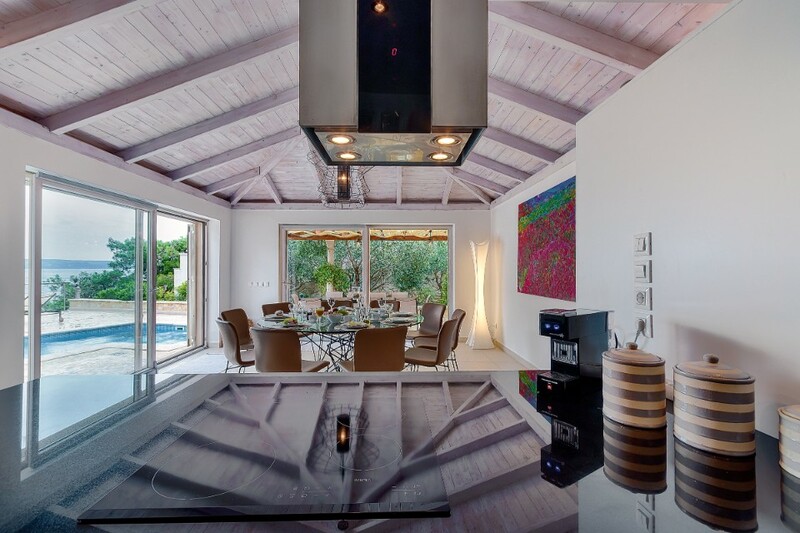 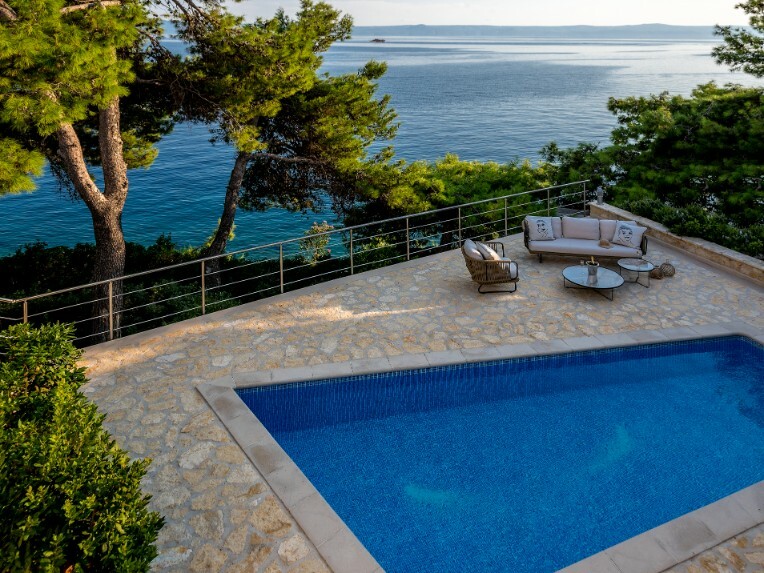 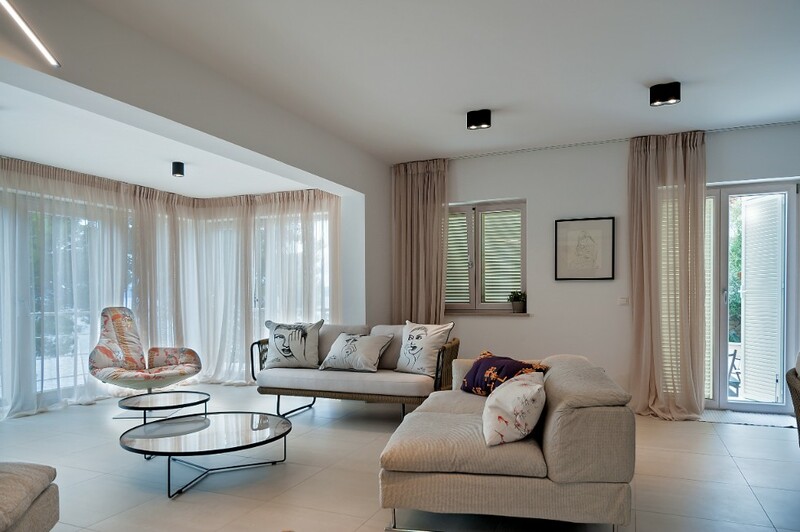 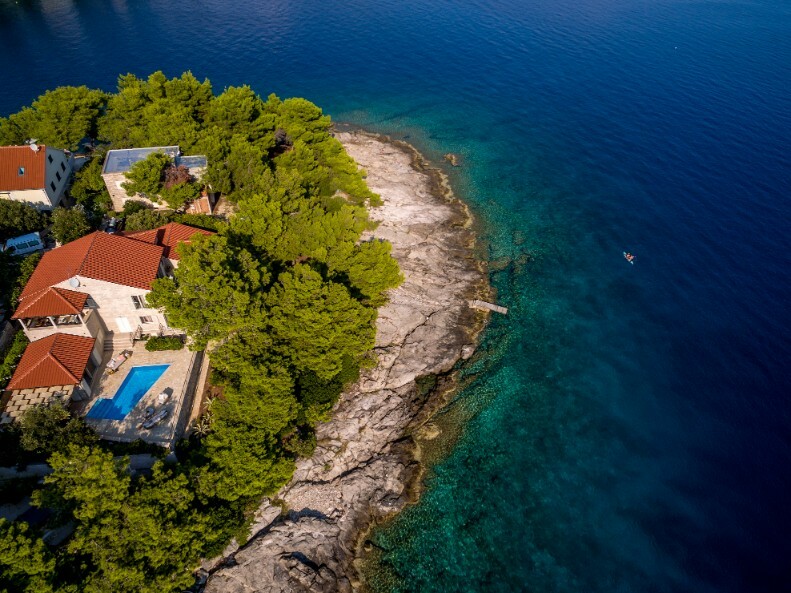 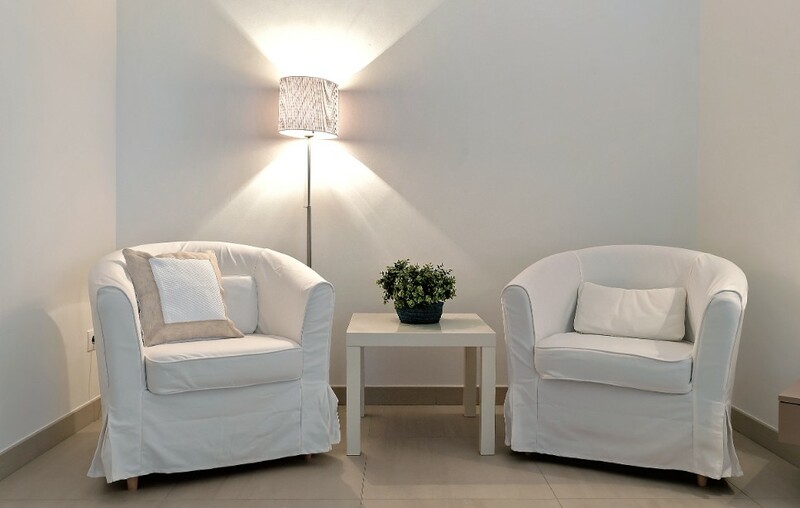 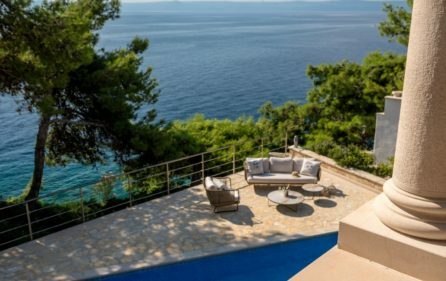 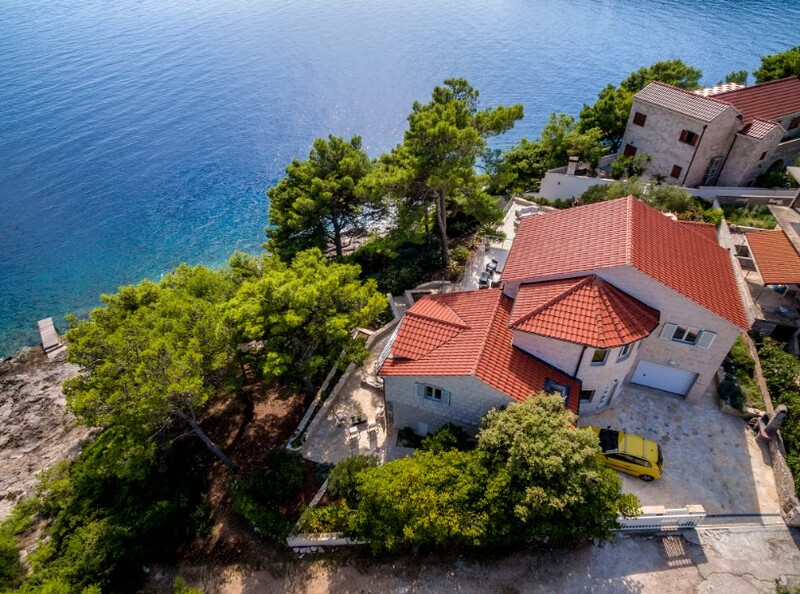 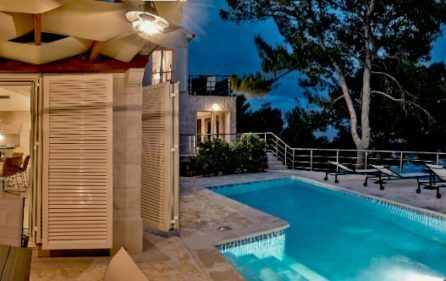 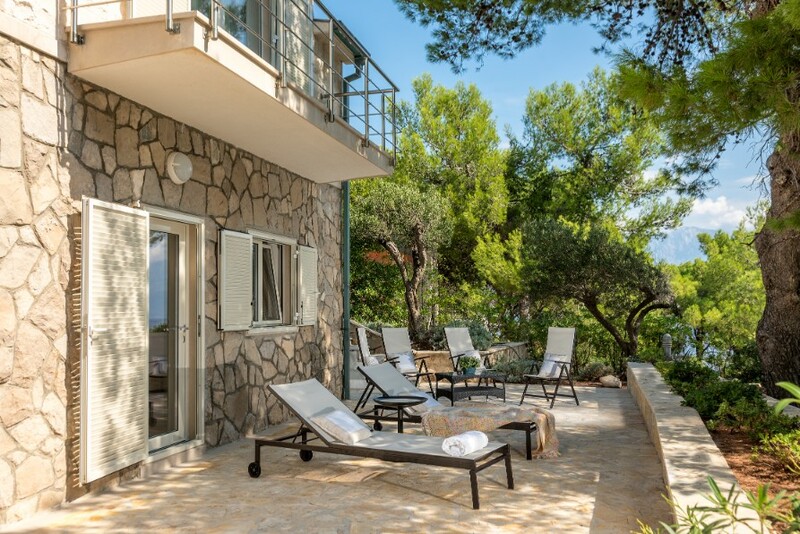 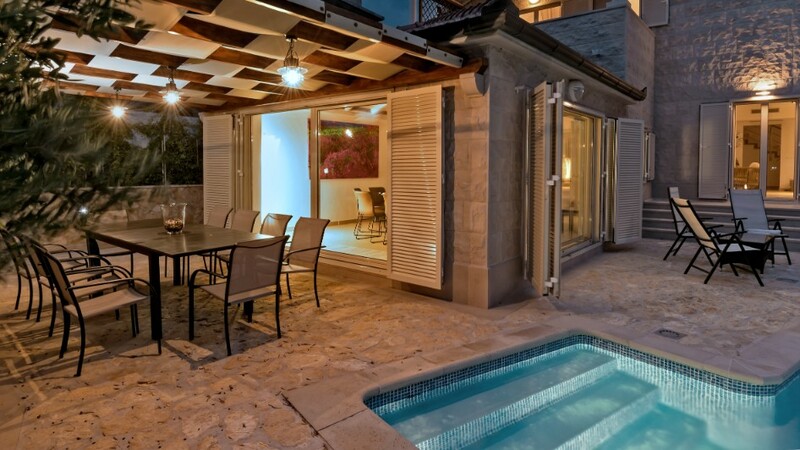 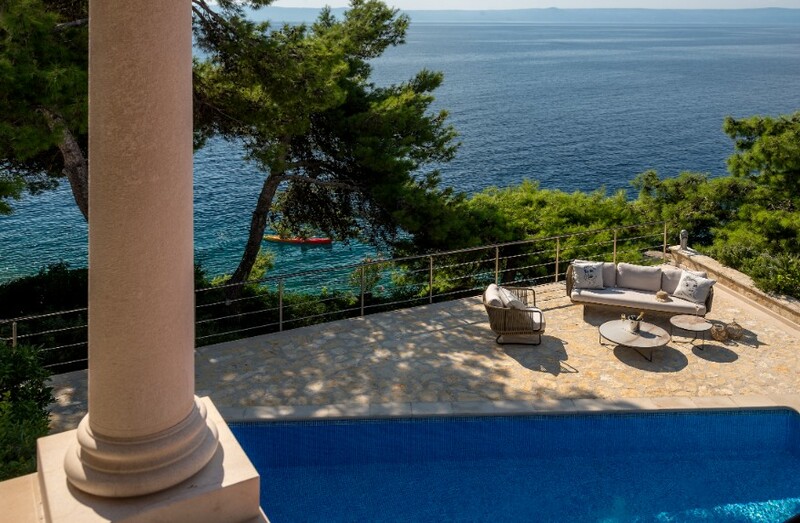 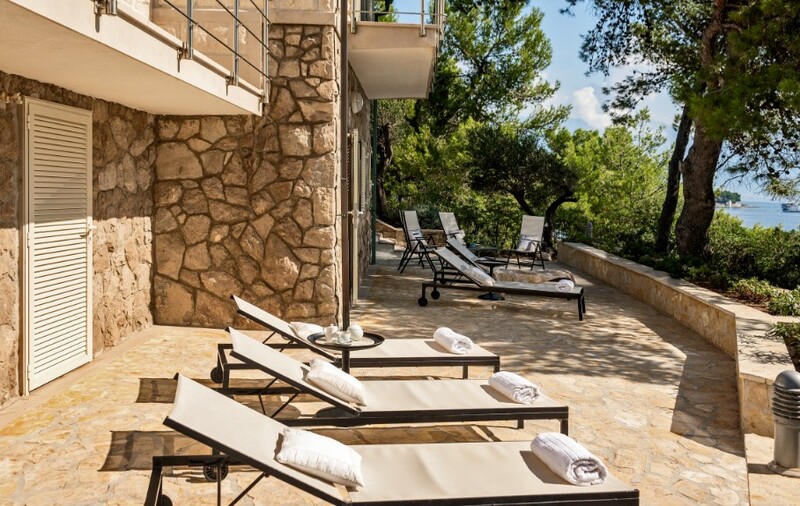 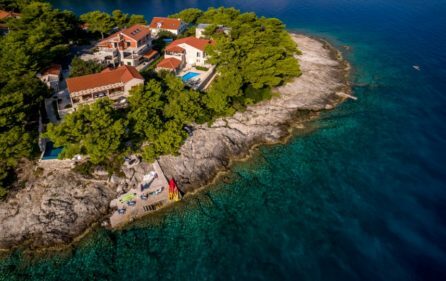 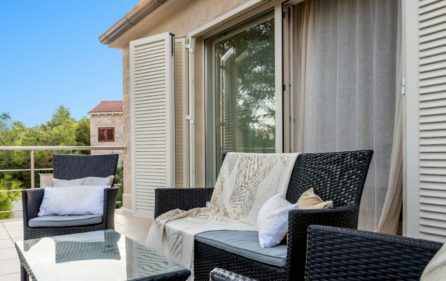 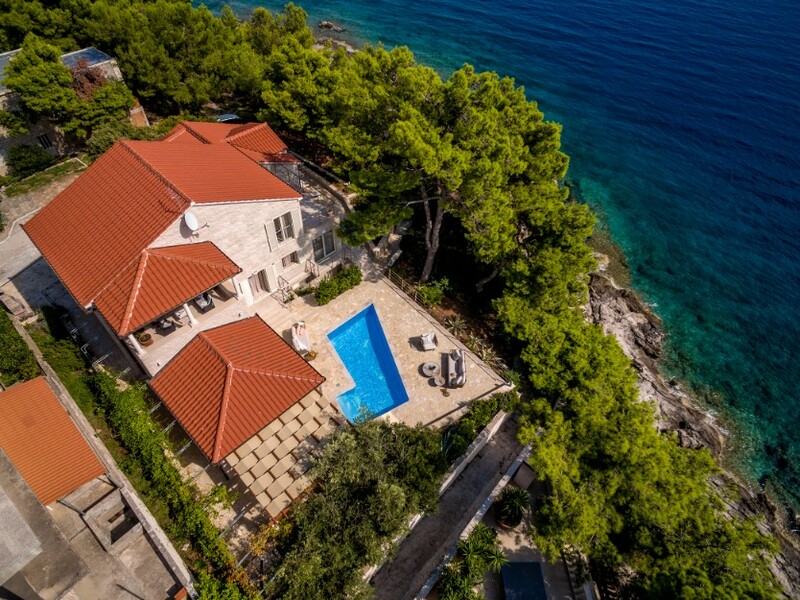 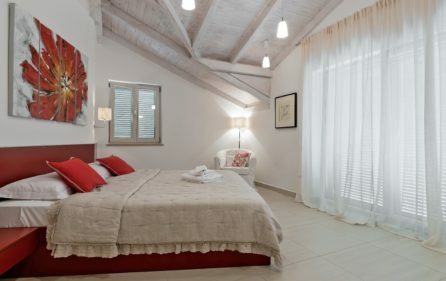 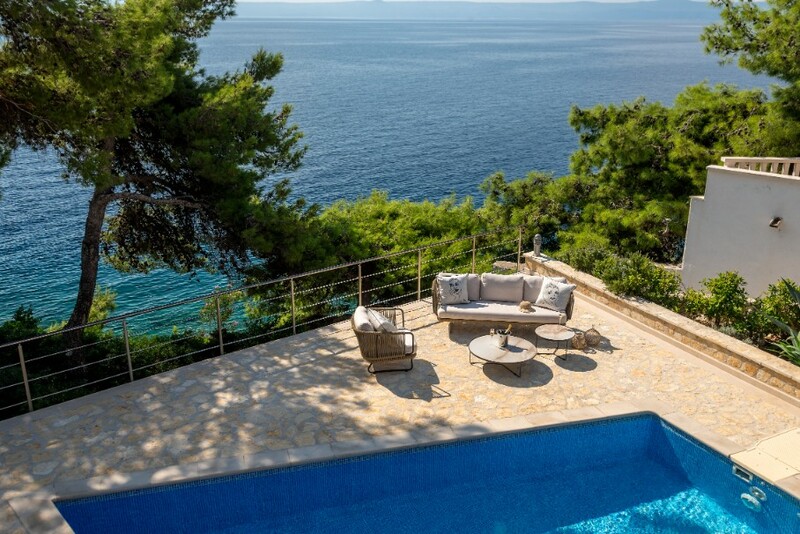 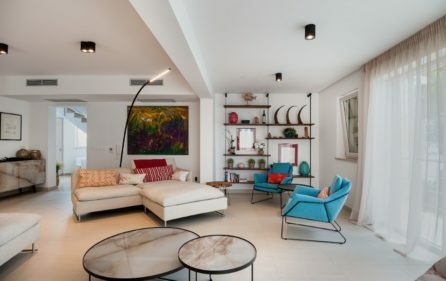 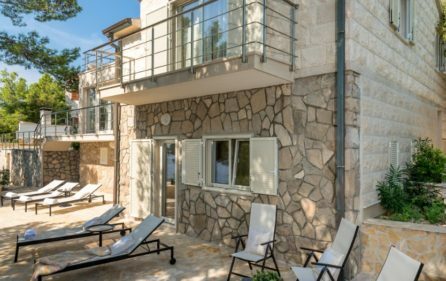 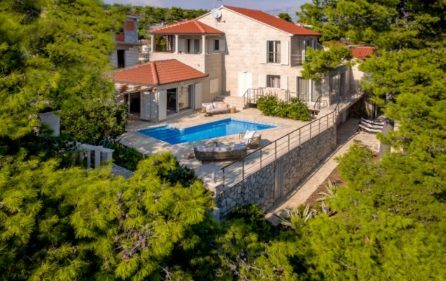 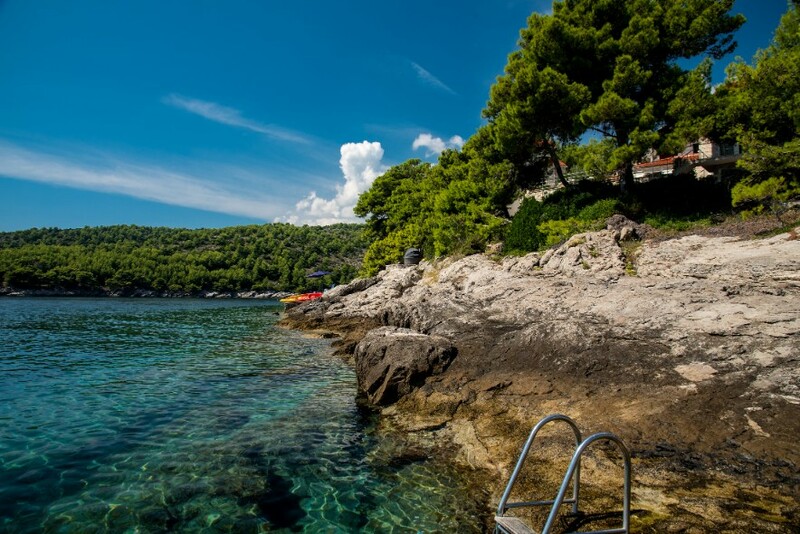 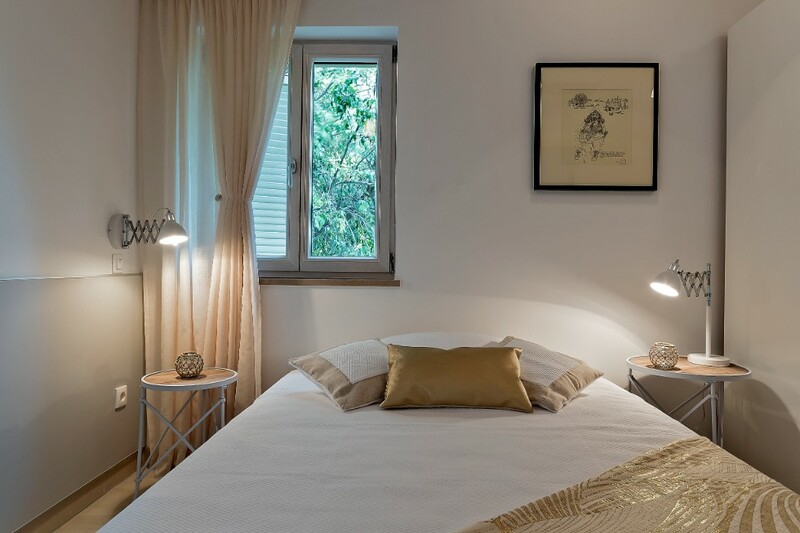 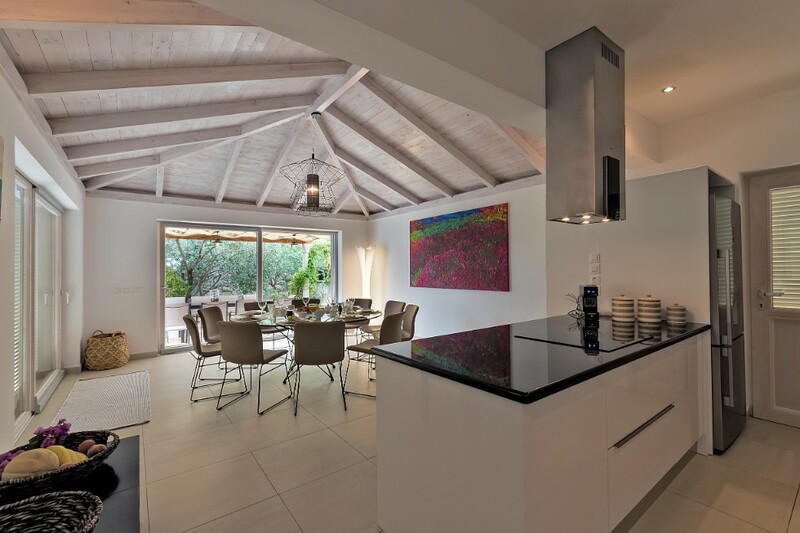 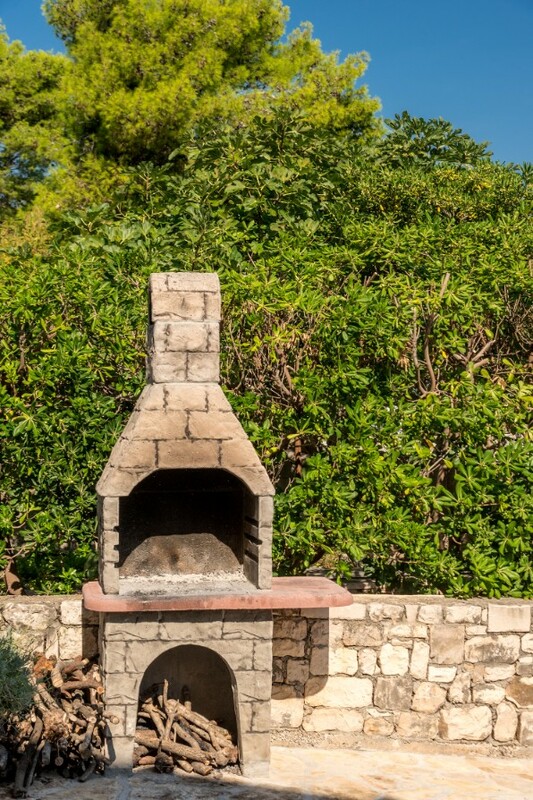 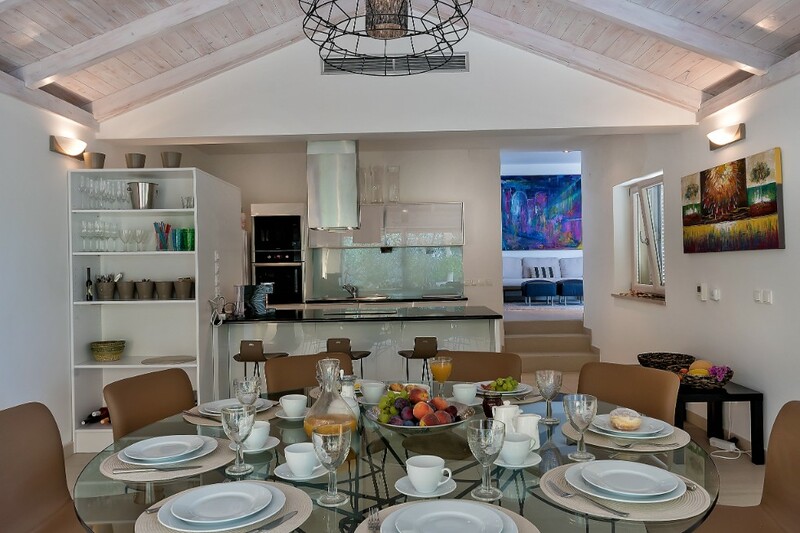 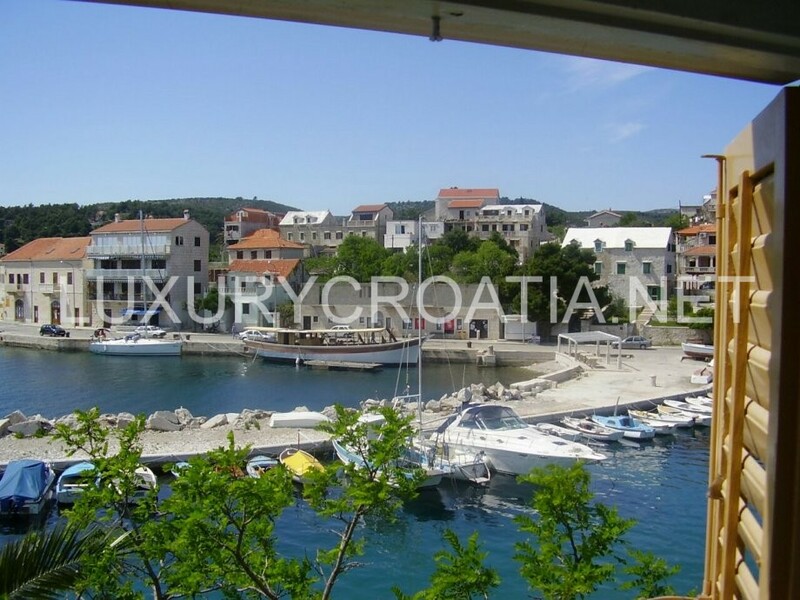 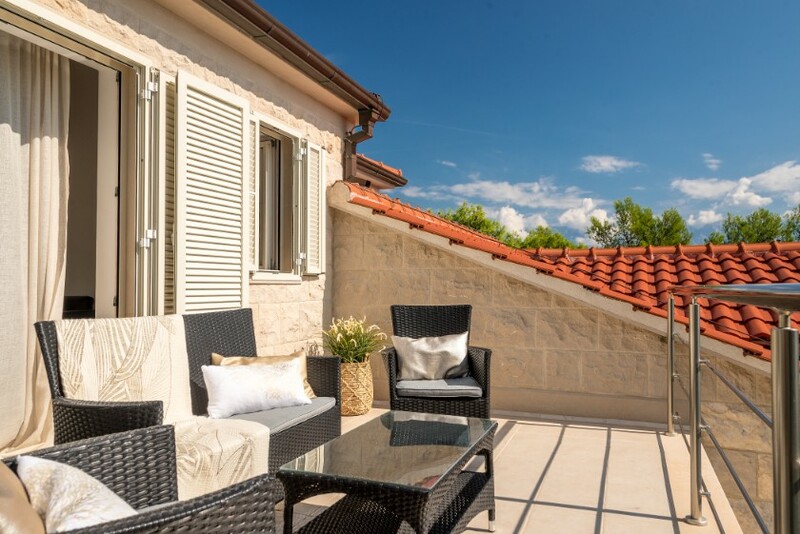 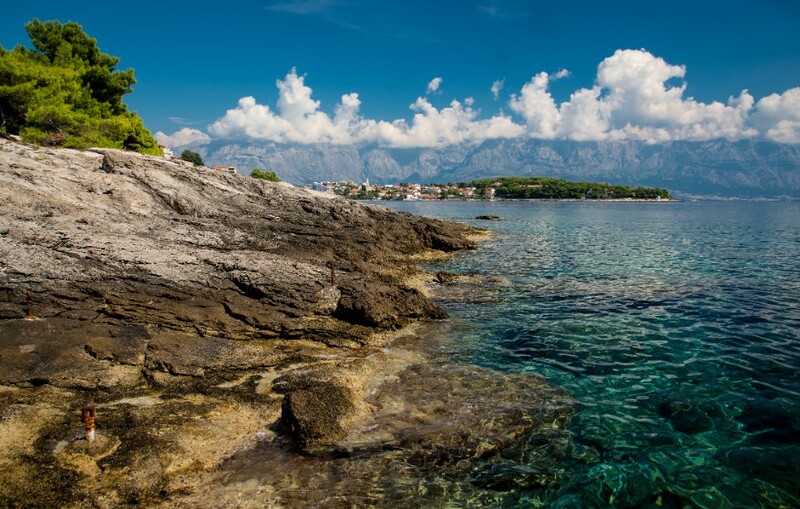 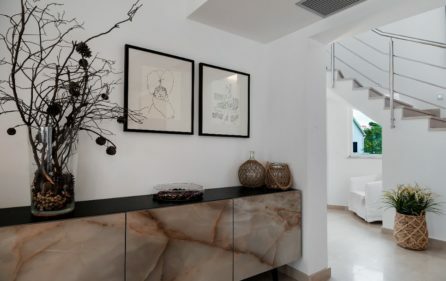 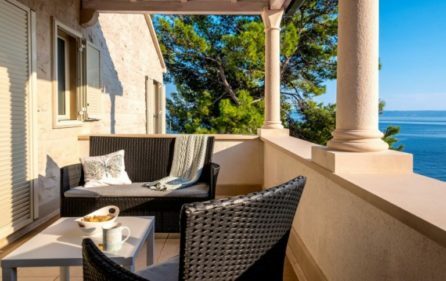 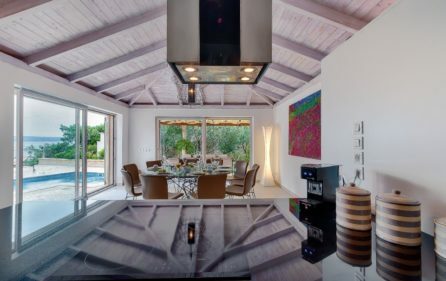 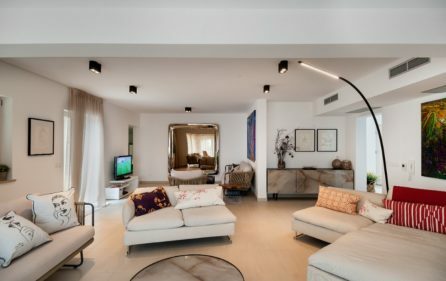 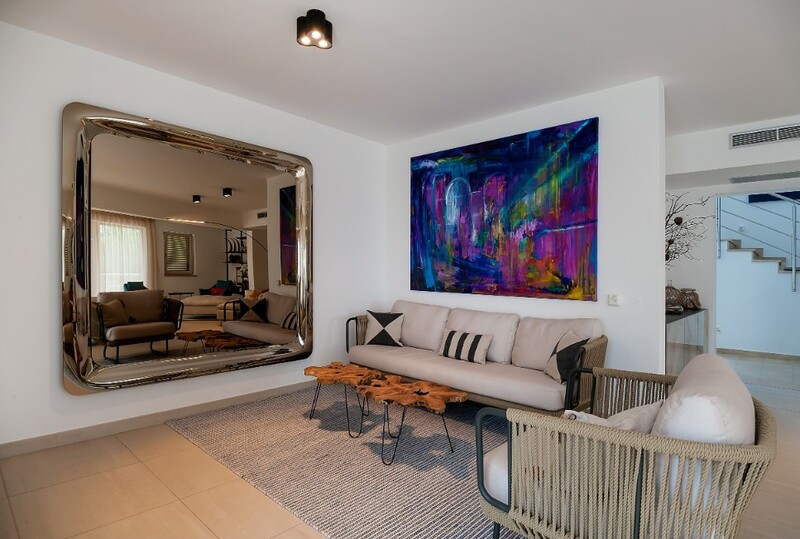 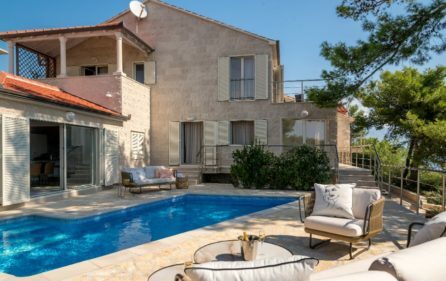 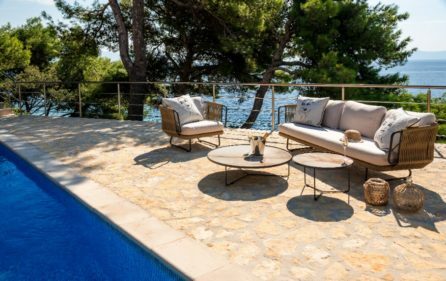 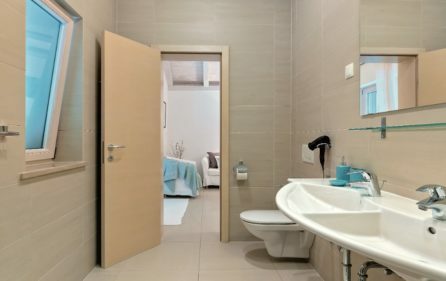 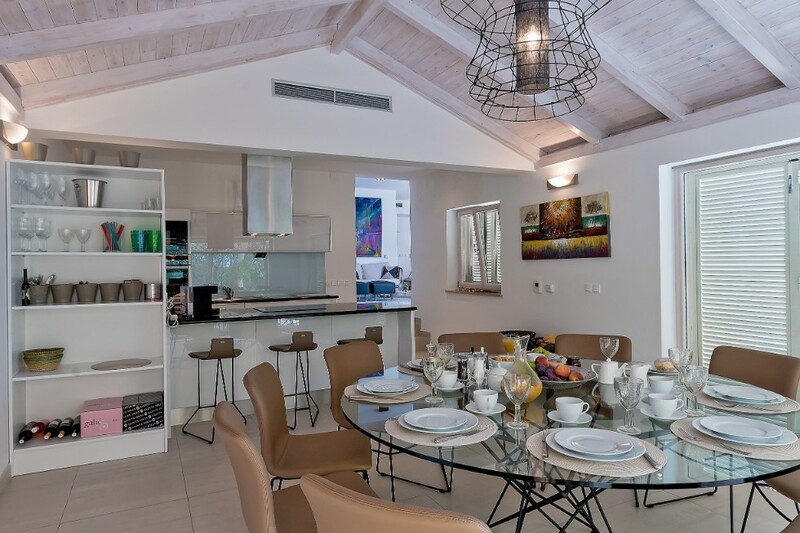 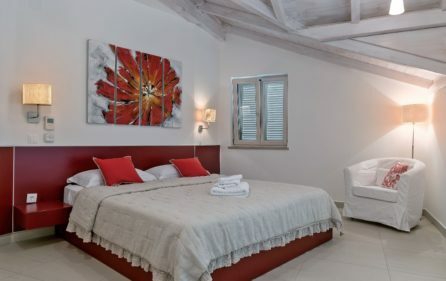 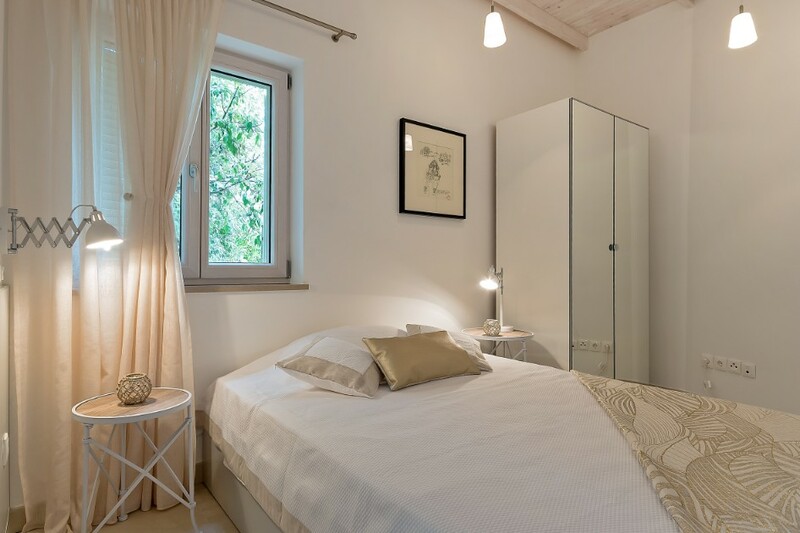 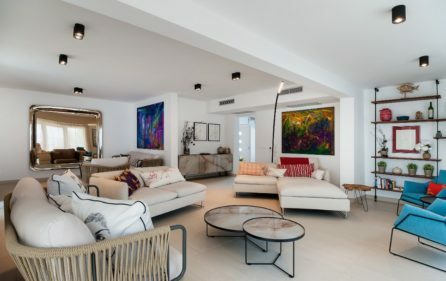 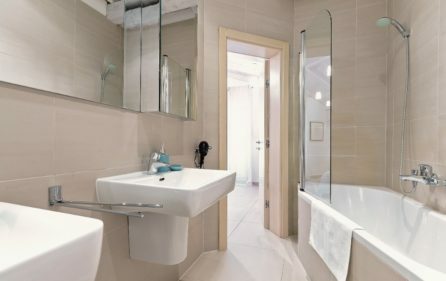 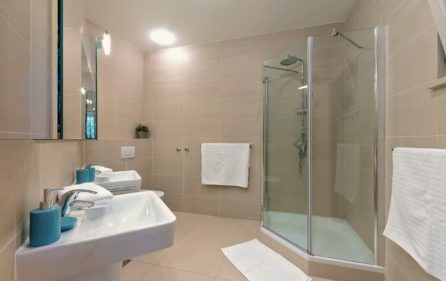 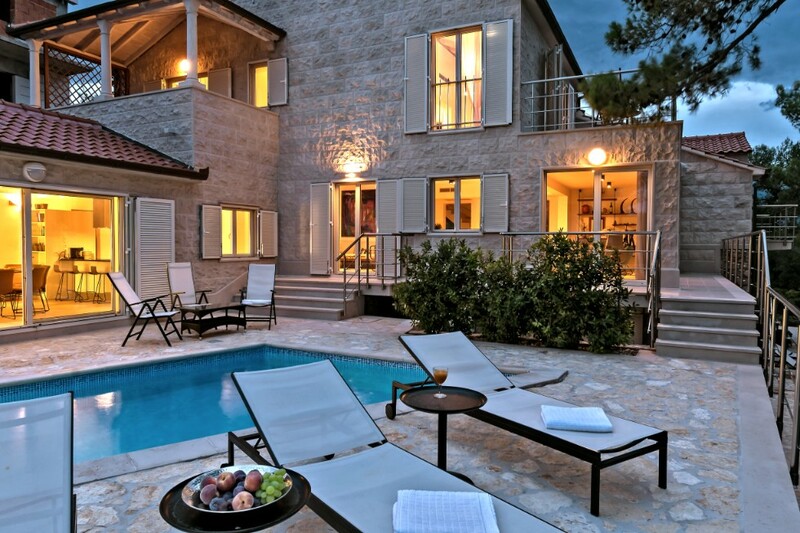 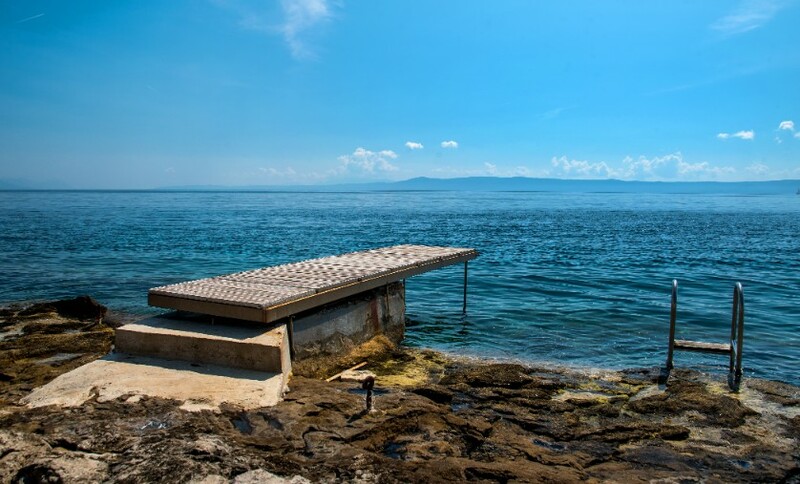 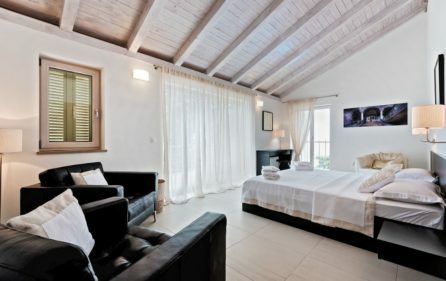 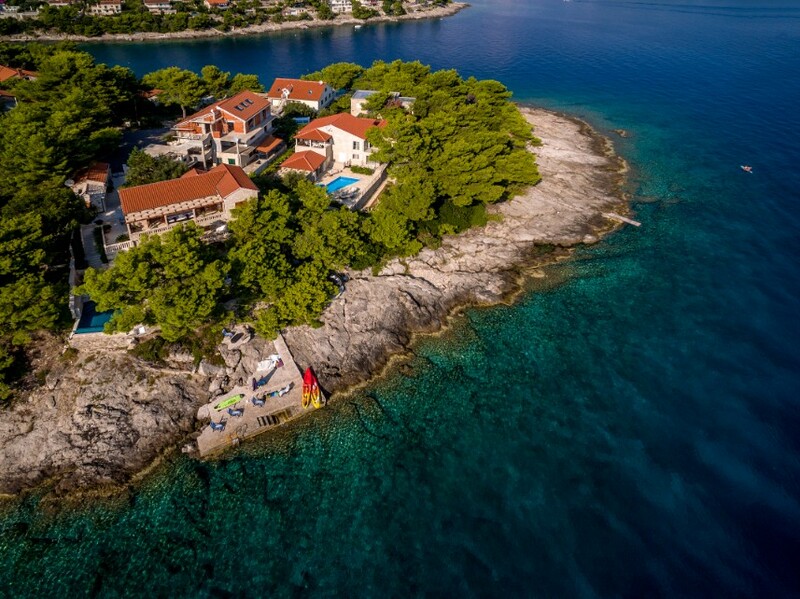 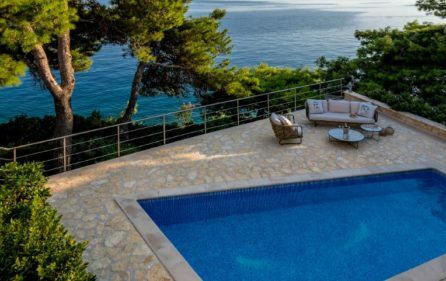 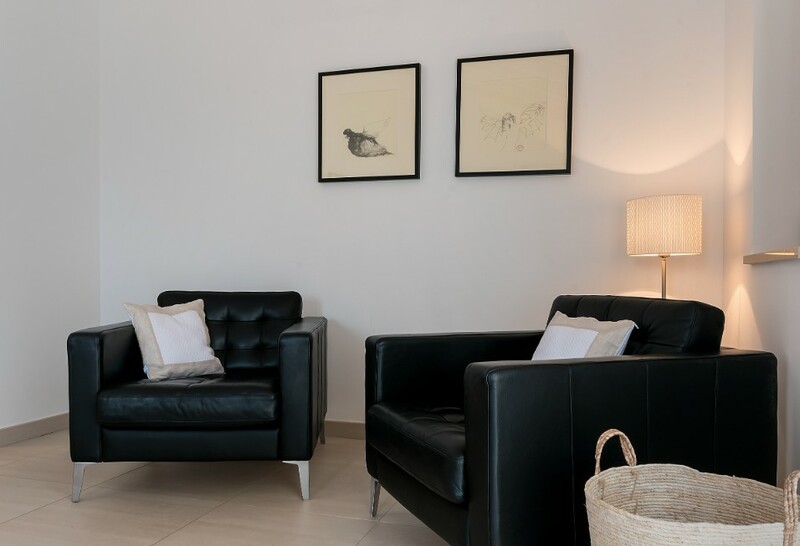 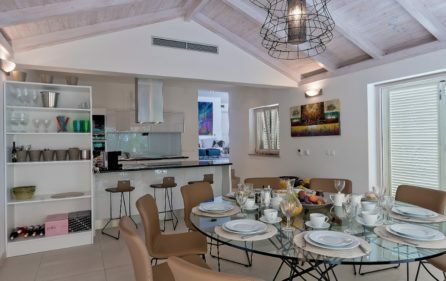 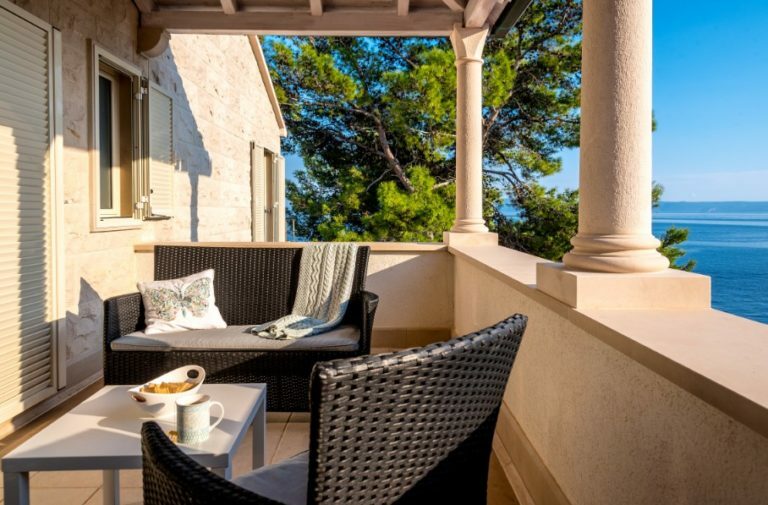 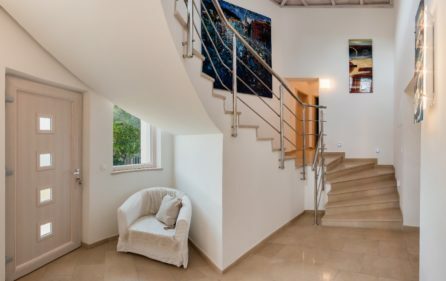 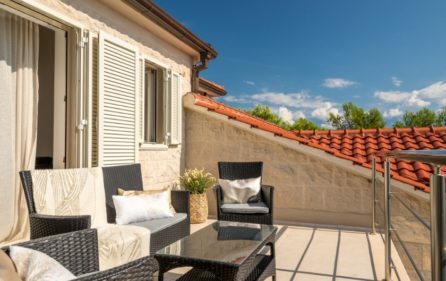 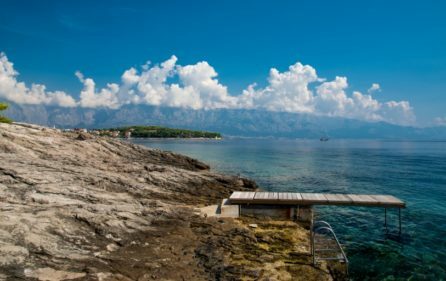 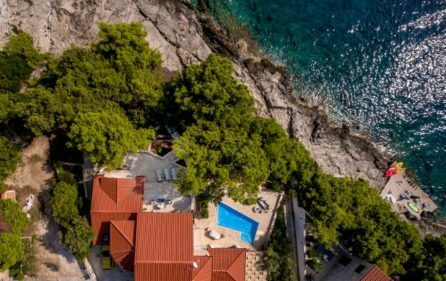 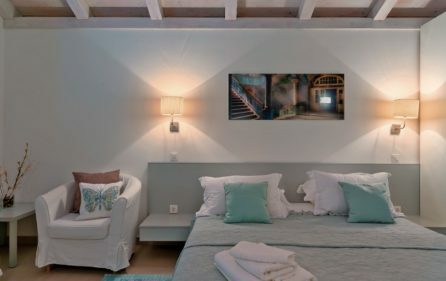 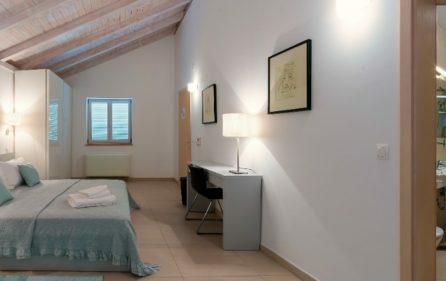 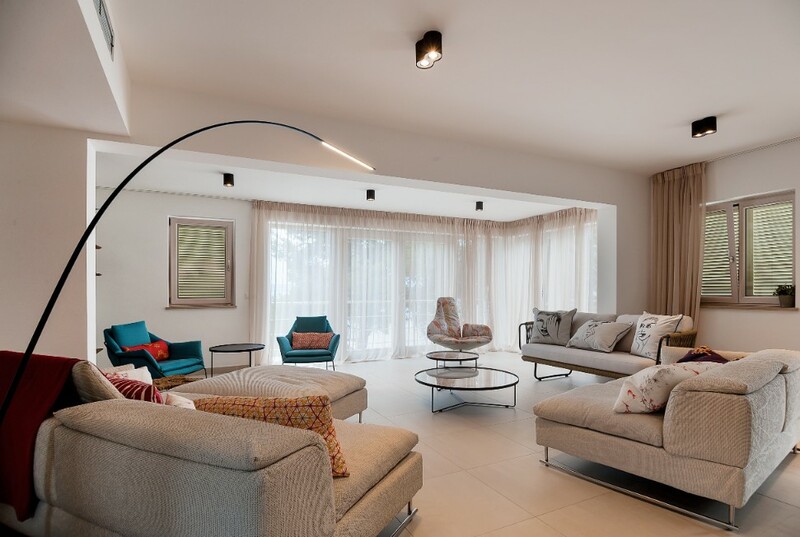 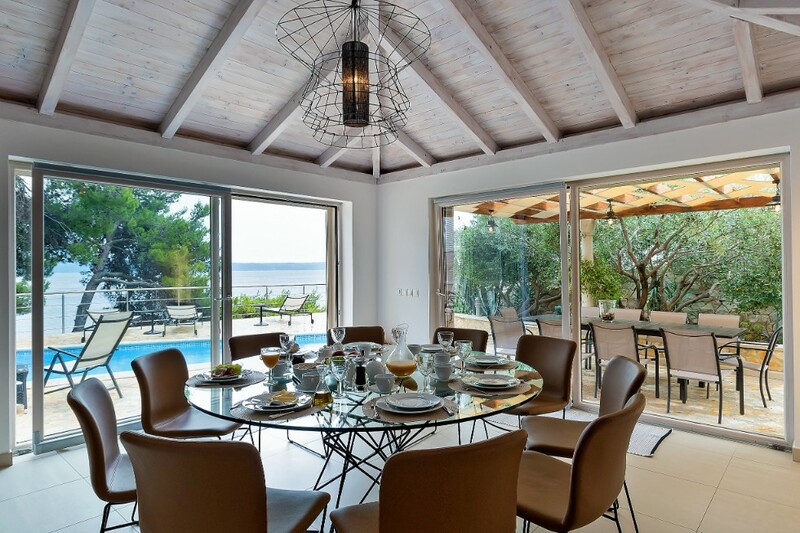 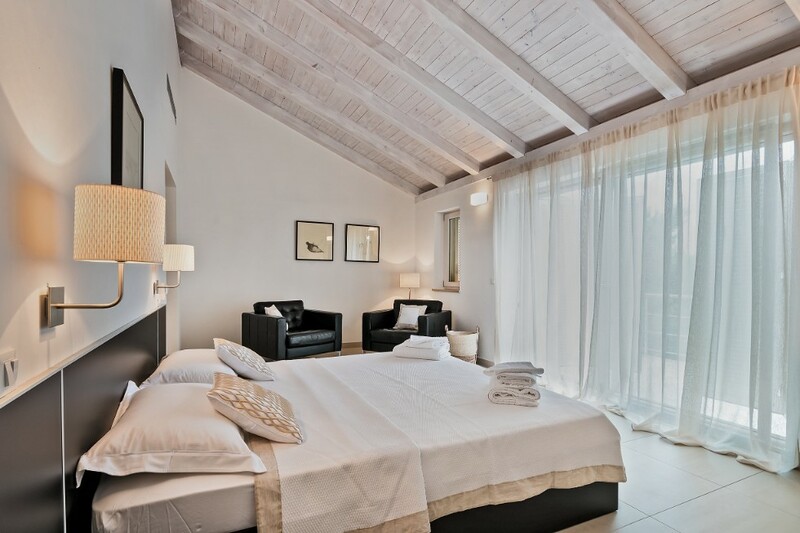 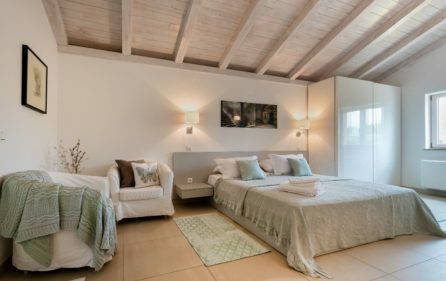 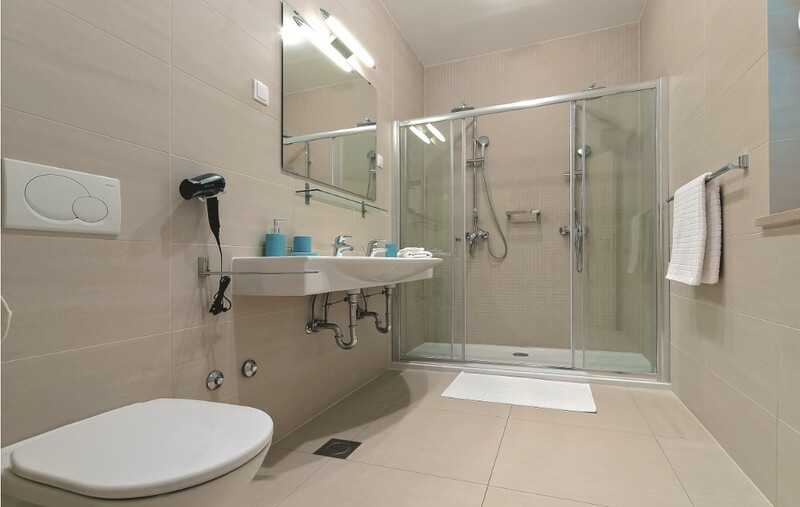 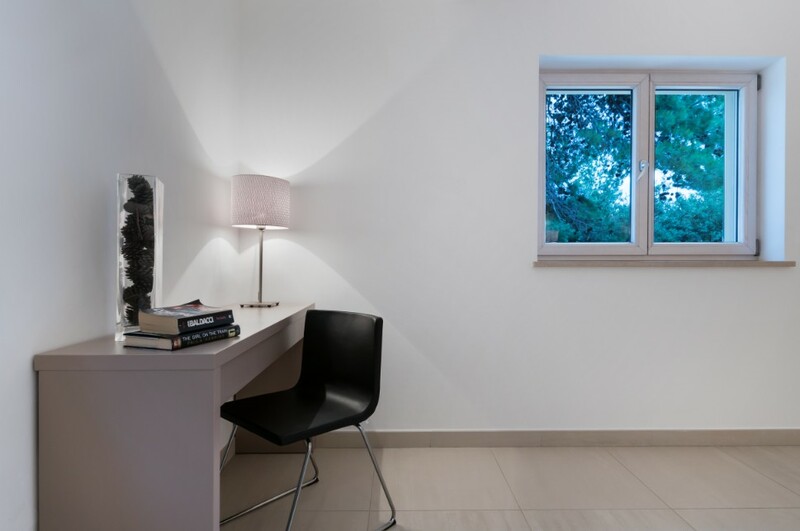 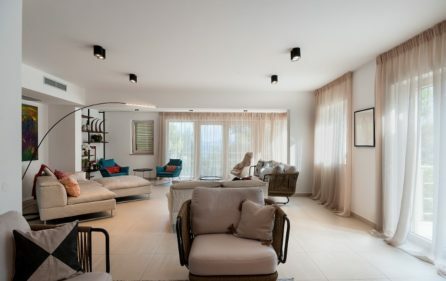 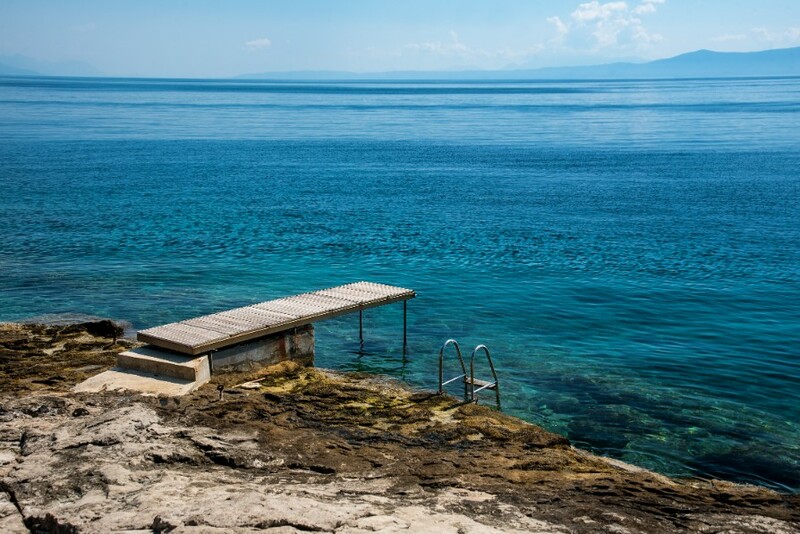 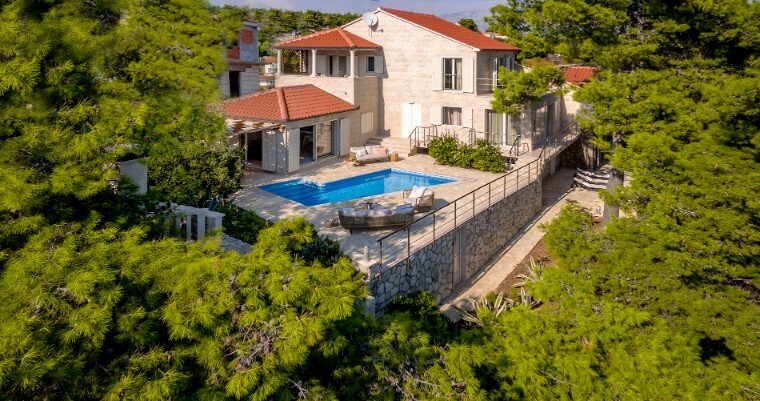 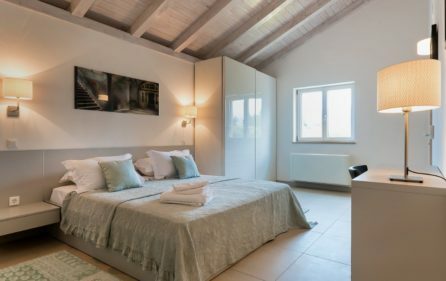 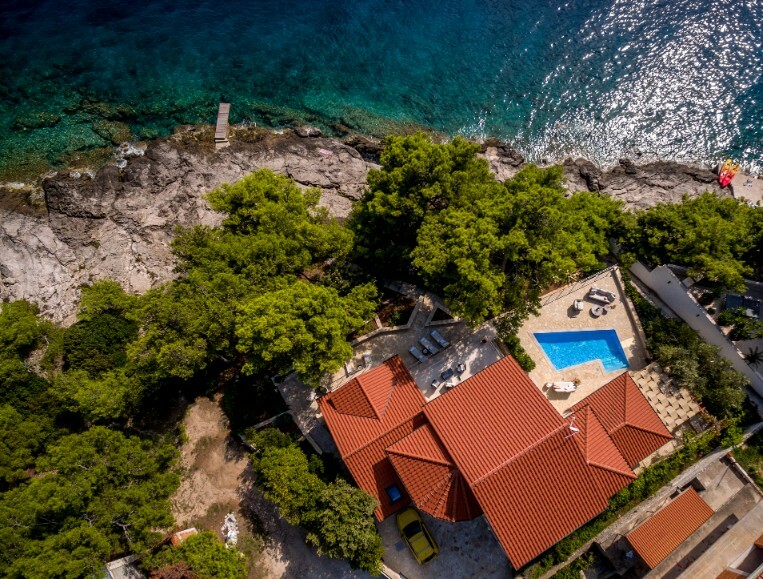 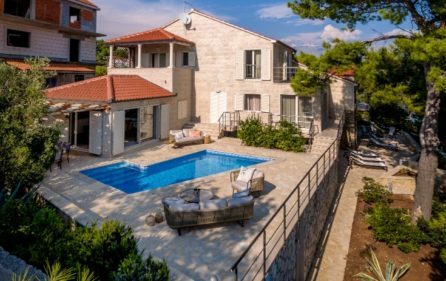 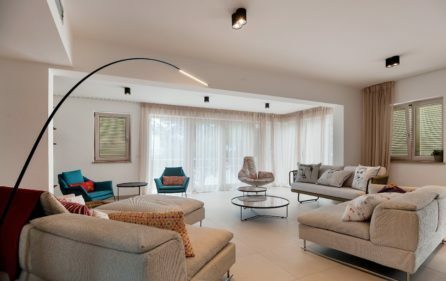 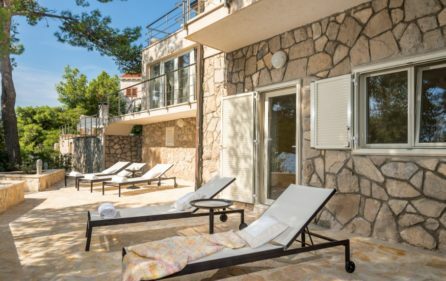 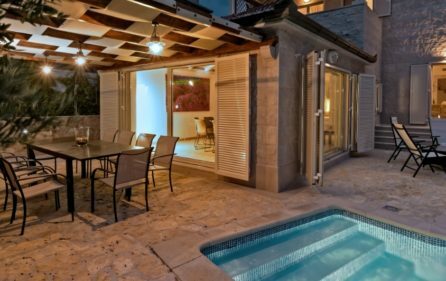 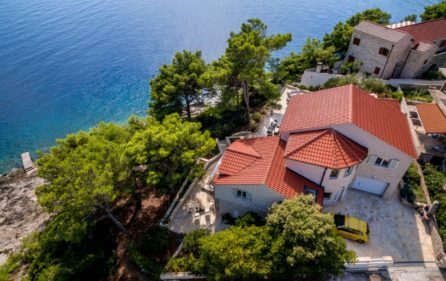 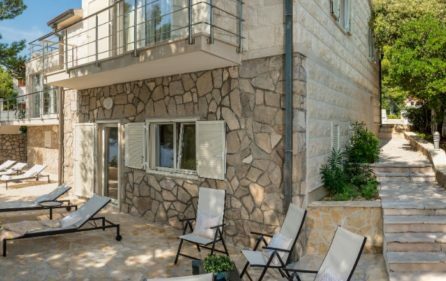 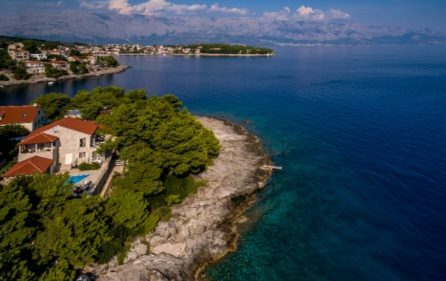 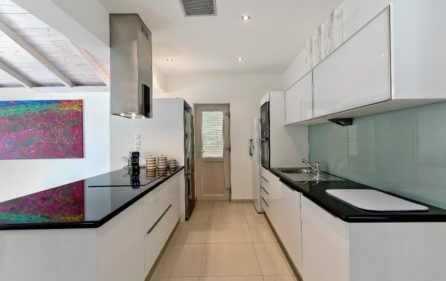 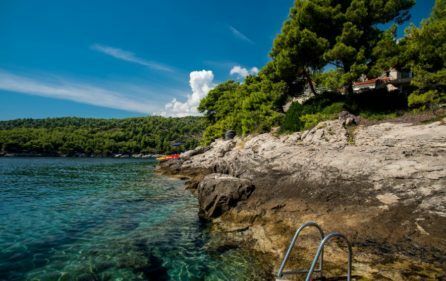 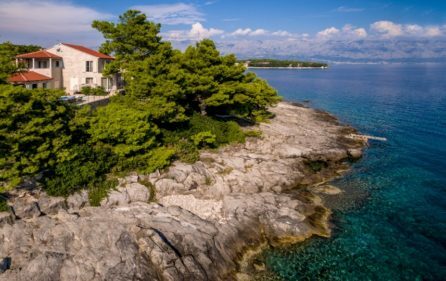 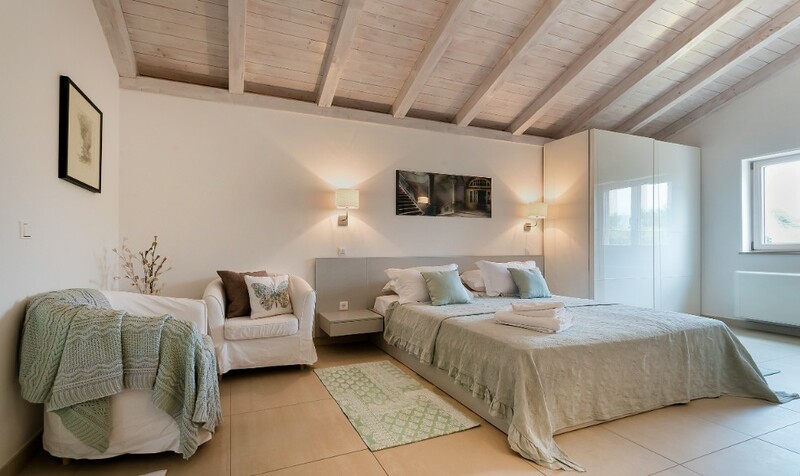 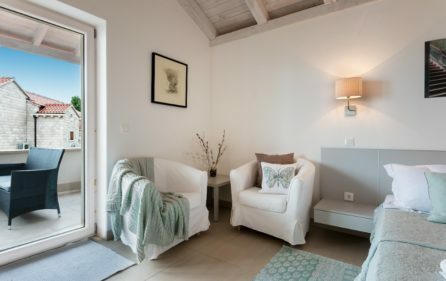 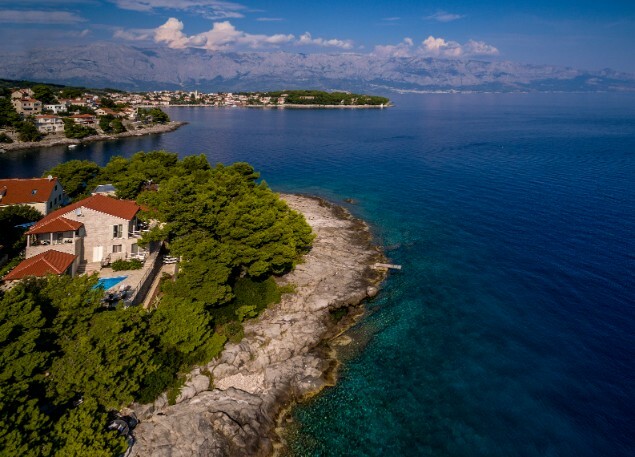 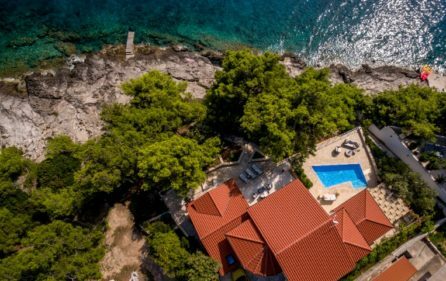 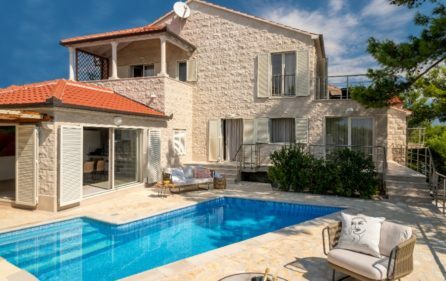 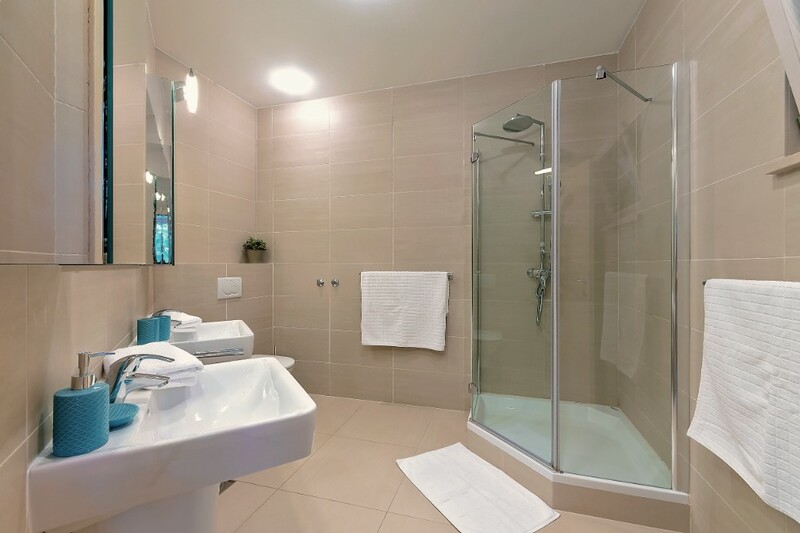 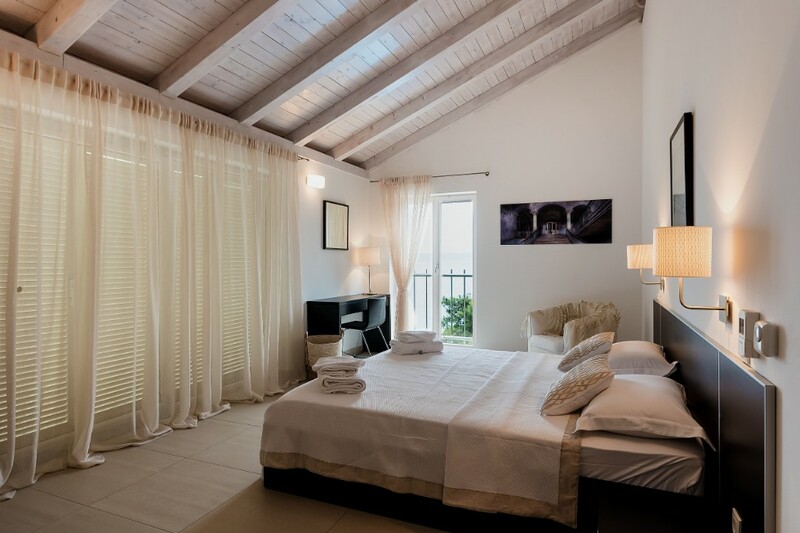 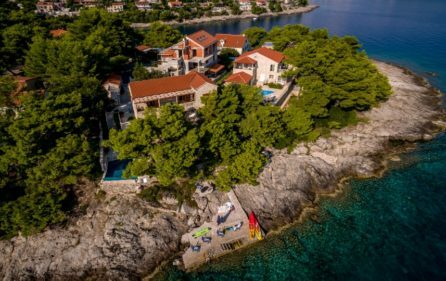 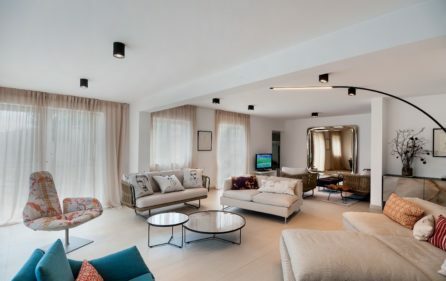 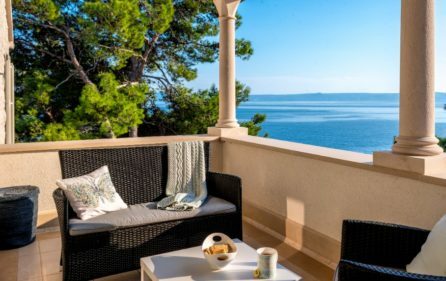 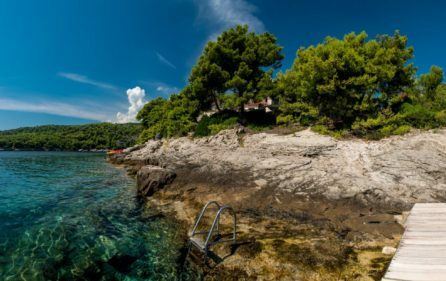 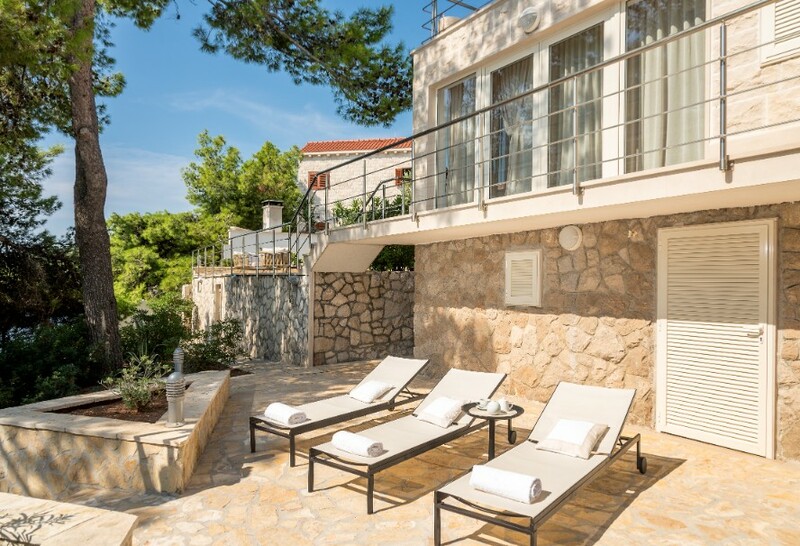 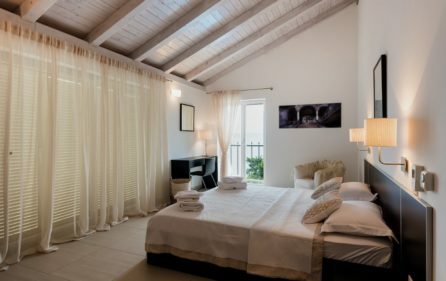 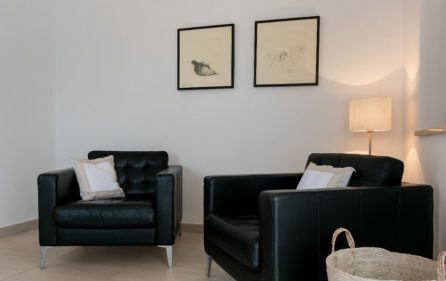 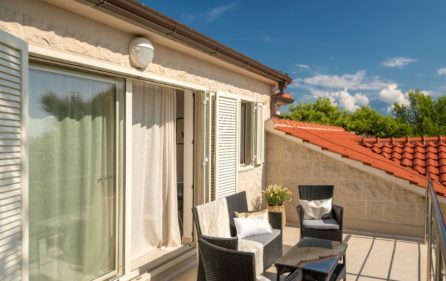 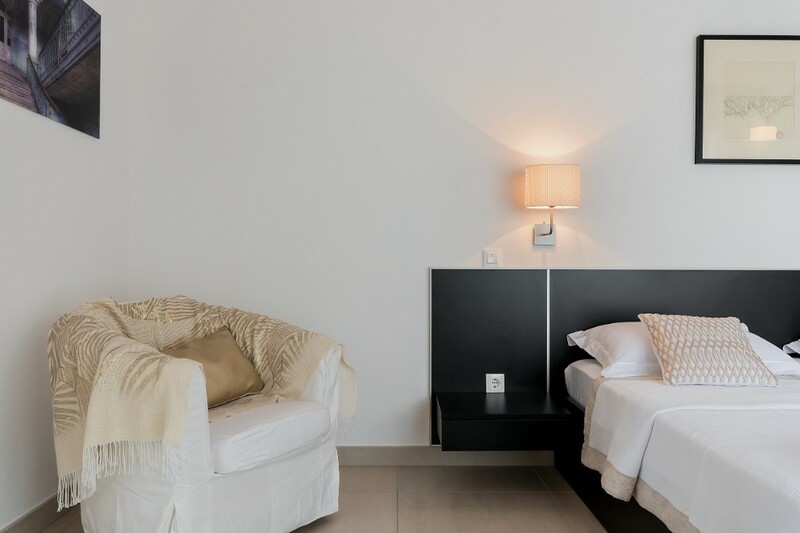 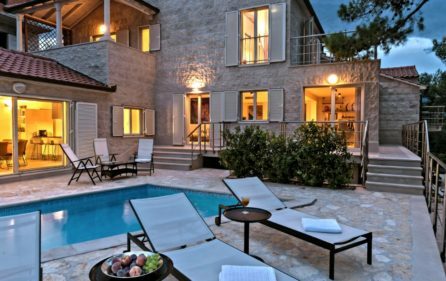 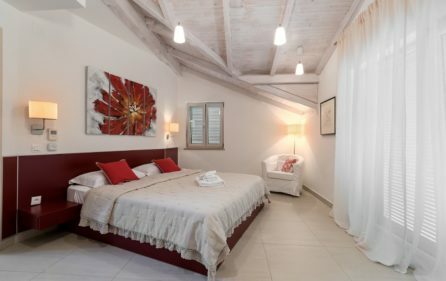 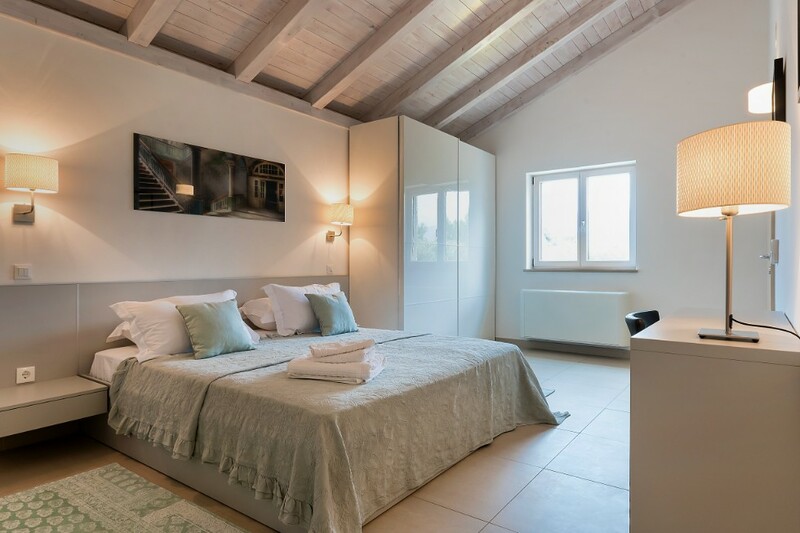 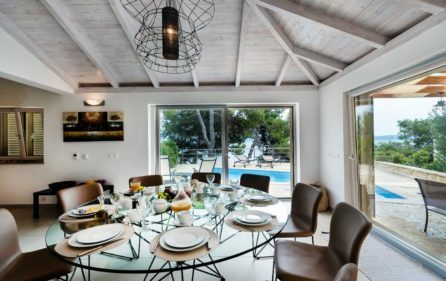 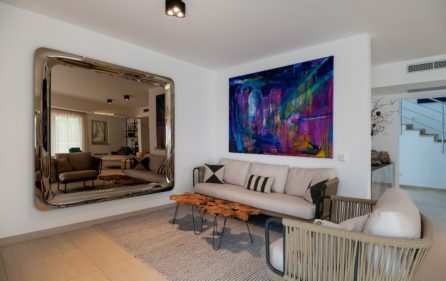 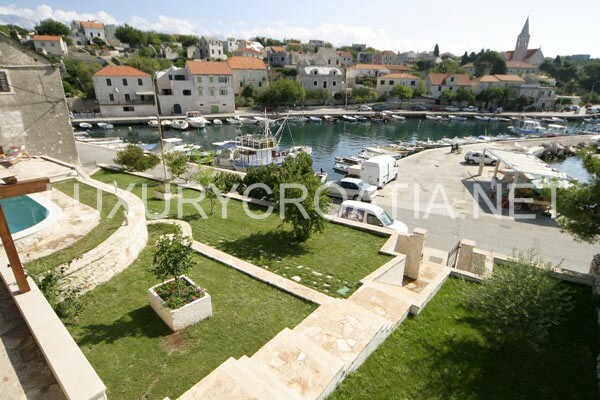 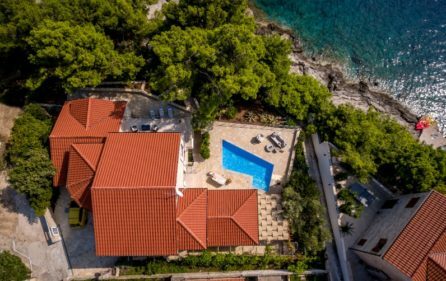 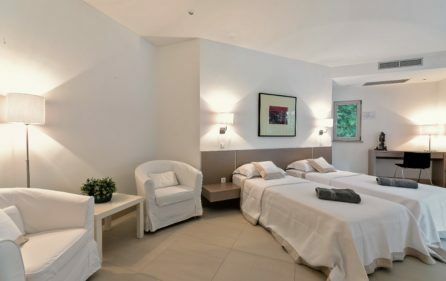 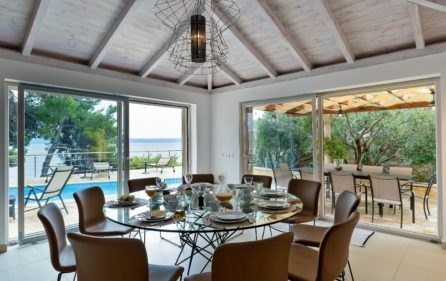 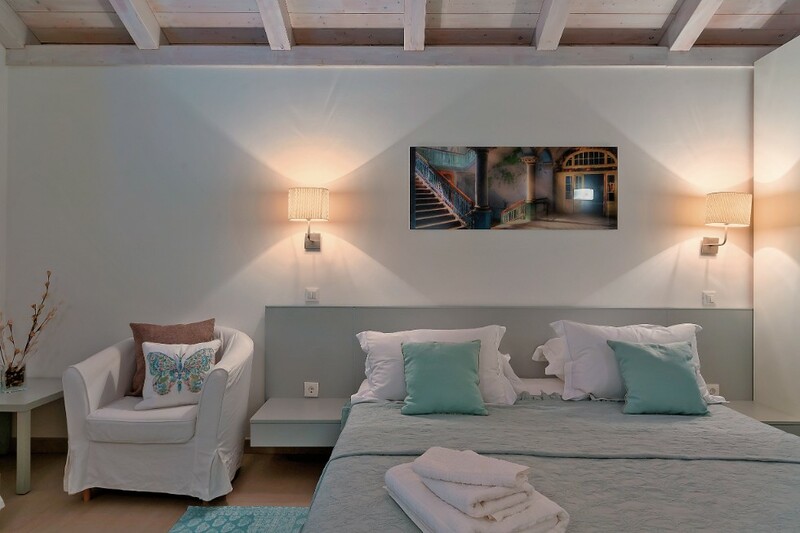 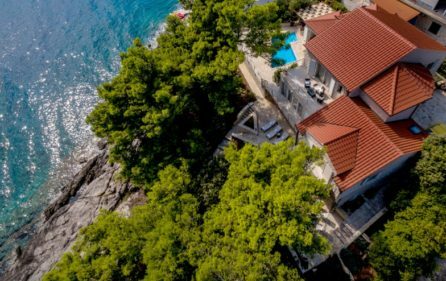 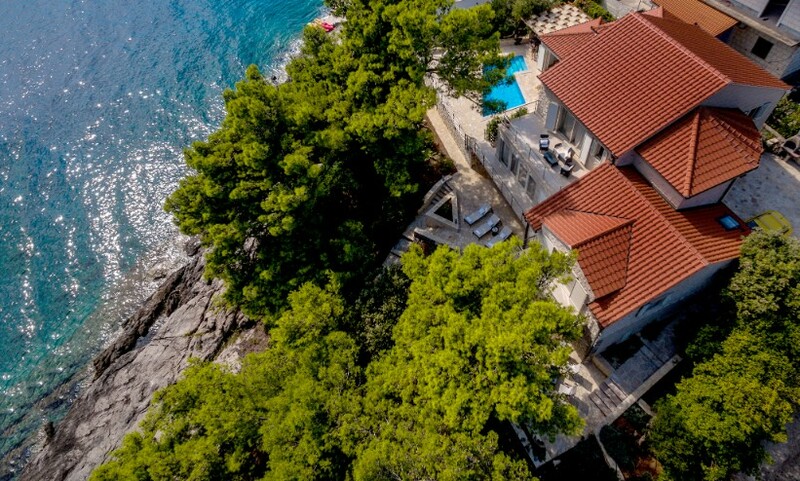 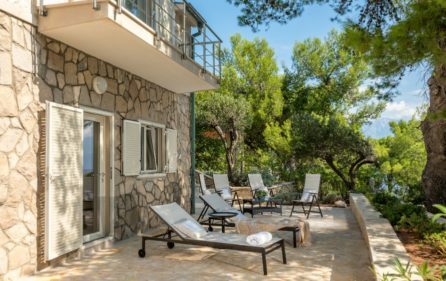 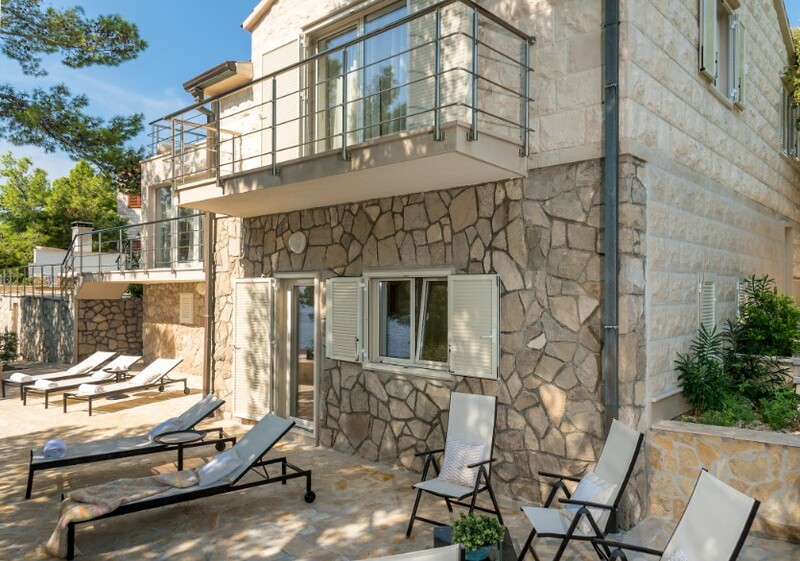 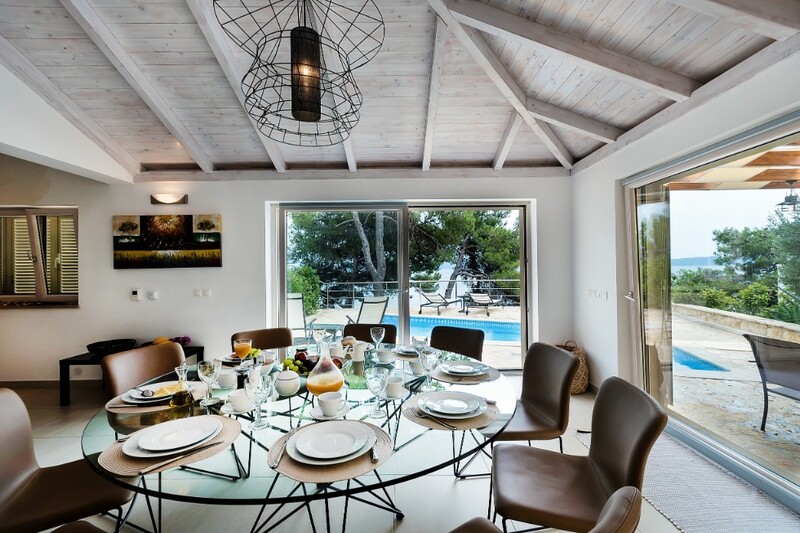 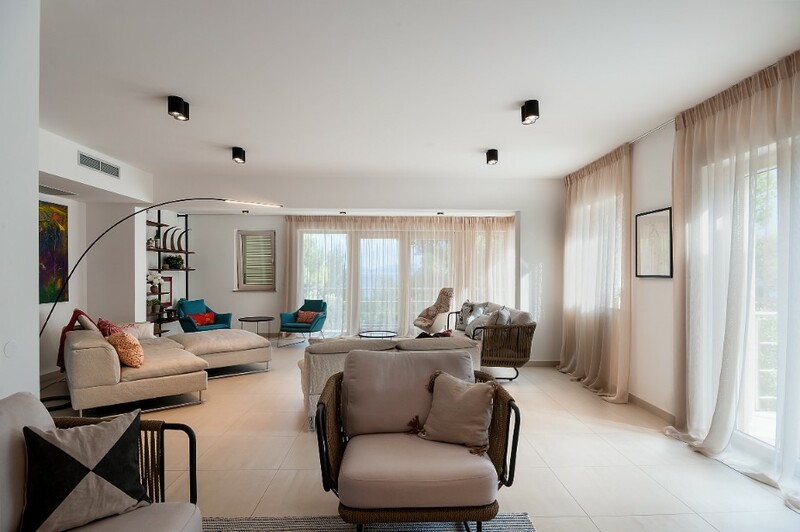 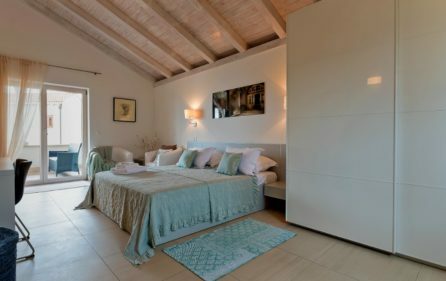 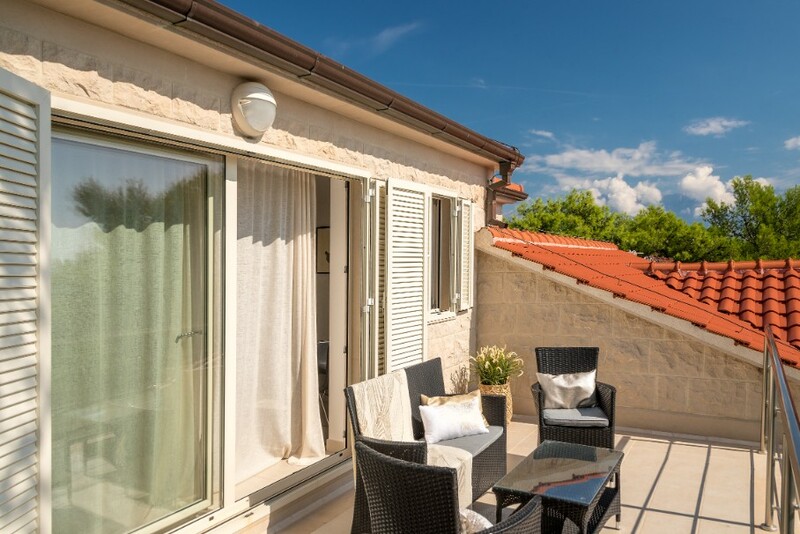 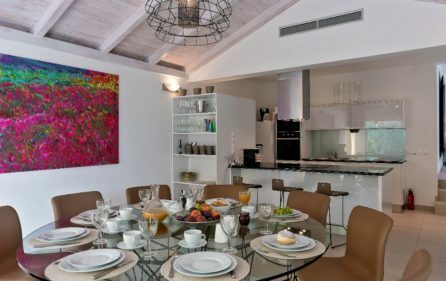 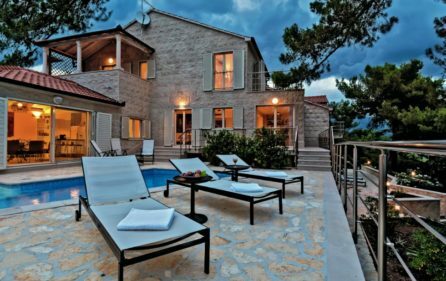 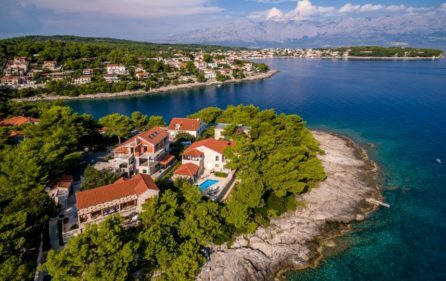 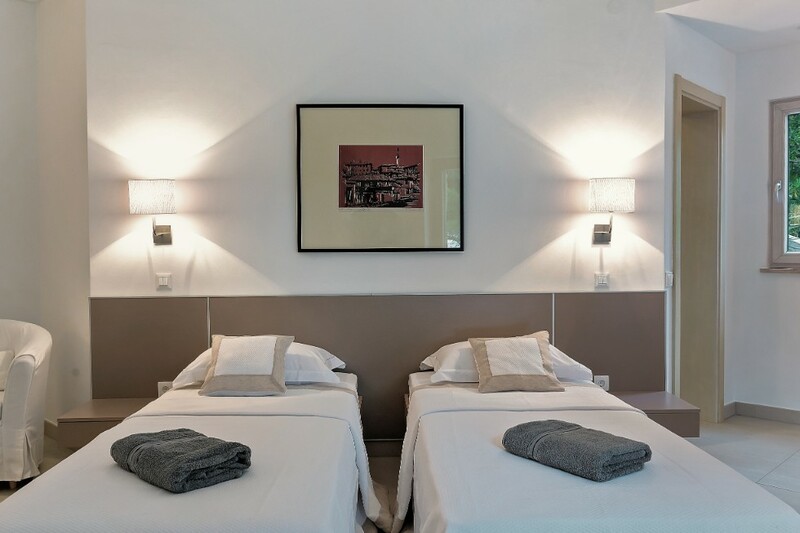 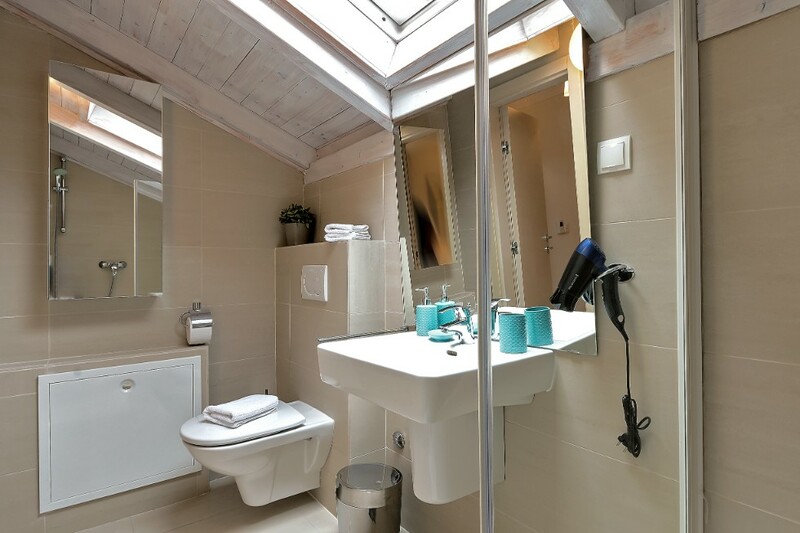 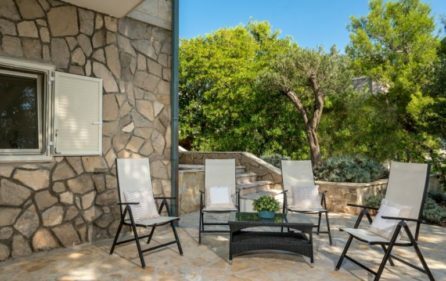 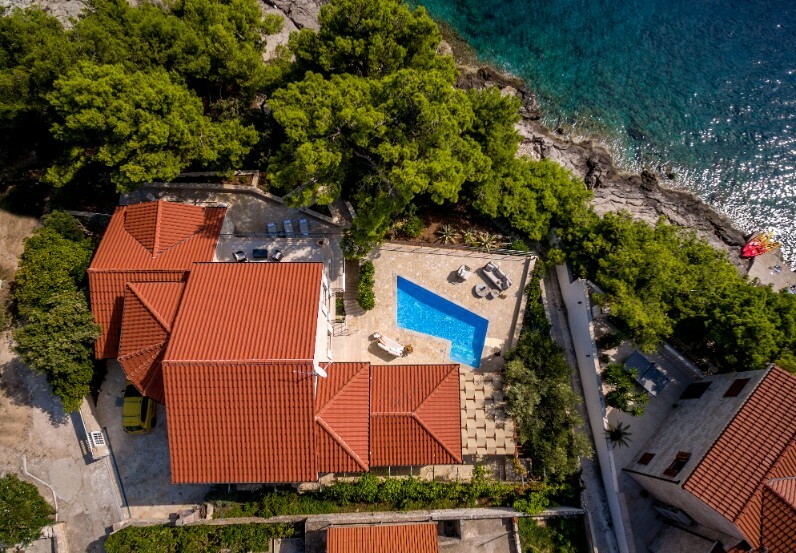 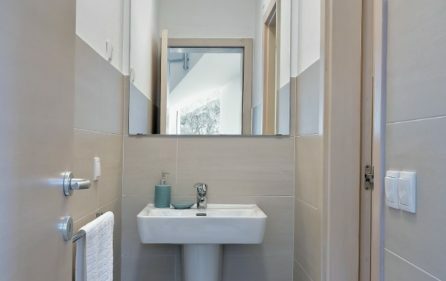 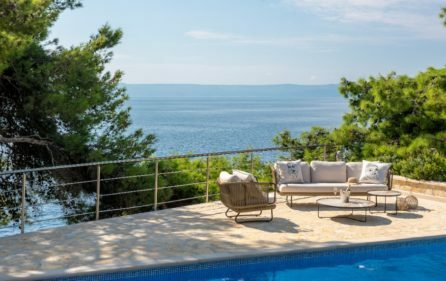 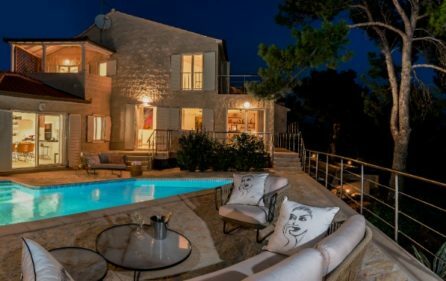 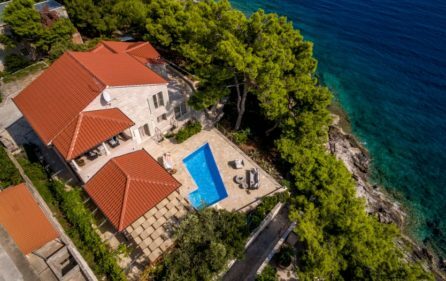 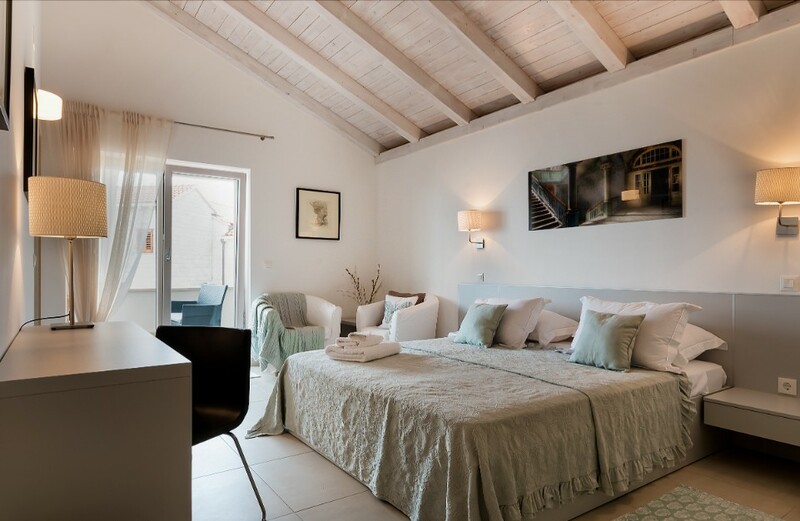 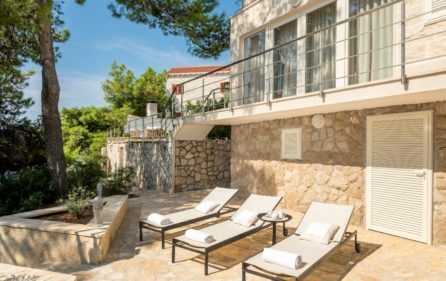 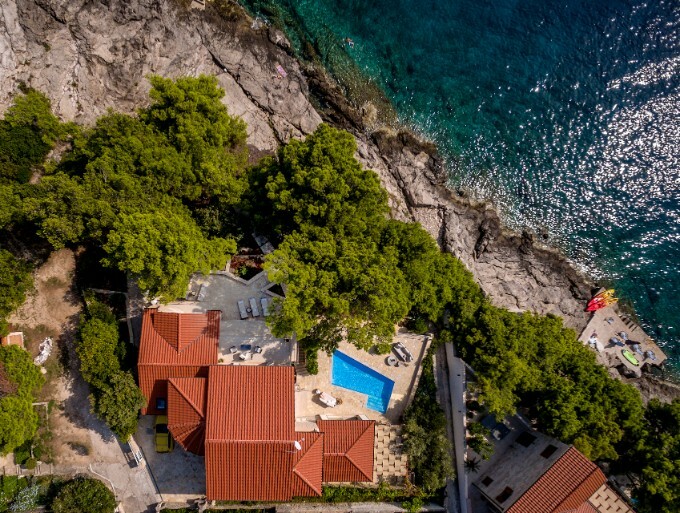 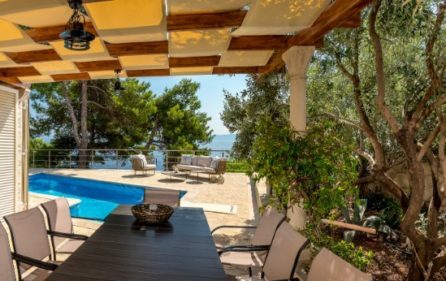 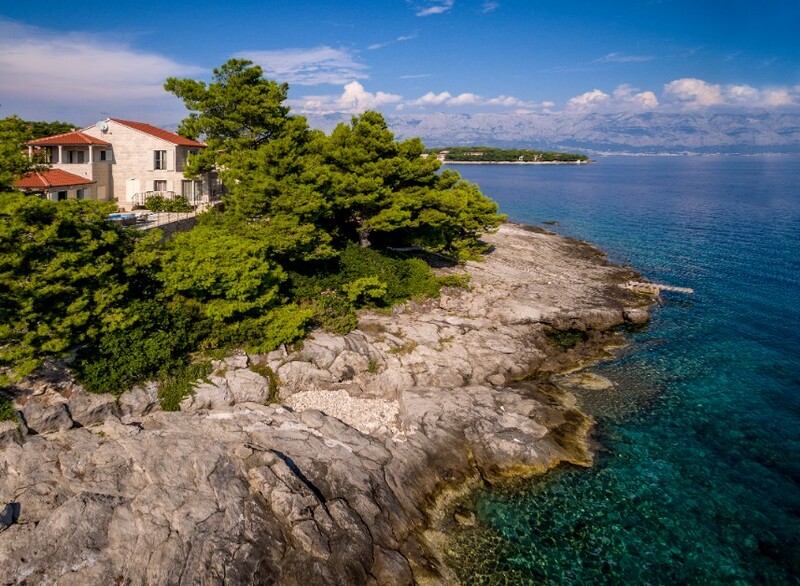 Seafront villa with pool for rent, Sumartin, island Brac – Positioned just moments from Sumartin’s fishing harbor and picturesque village of Selca, there is a luxury sea front villa in the exclusive Puntinak region on the island of Brac in the Dalmatian Riviera. 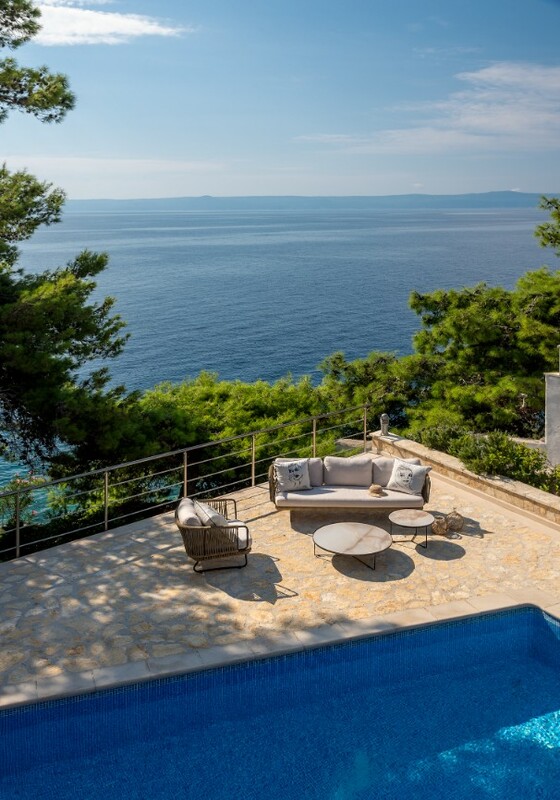 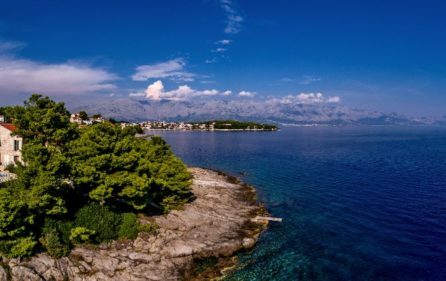 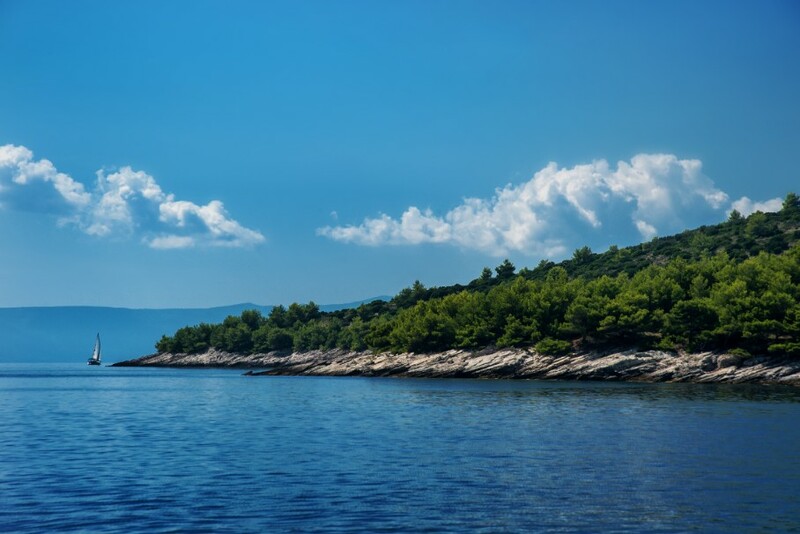 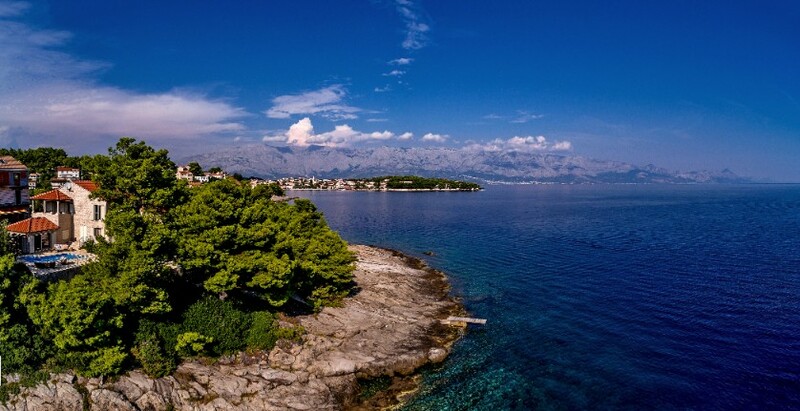 Sitting on the second cape, it ensures a panoramic view of Sumartin, Biokovo mountain, the Peljesac peninsula and the island of Hvar. 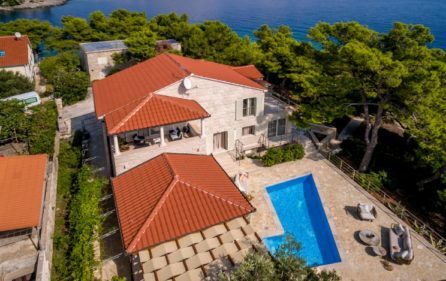 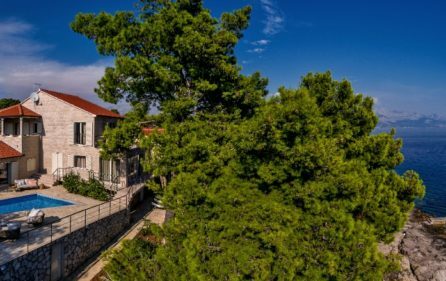 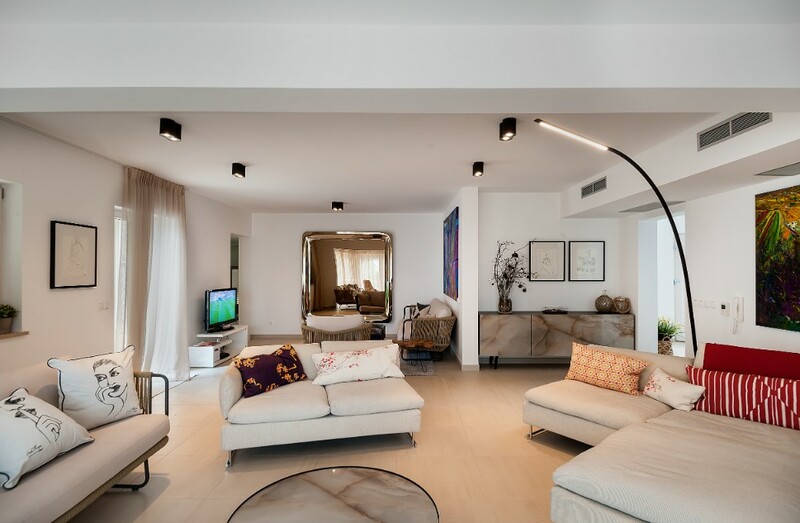 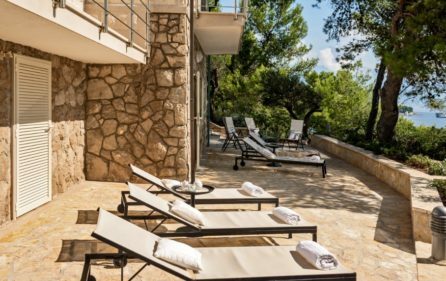 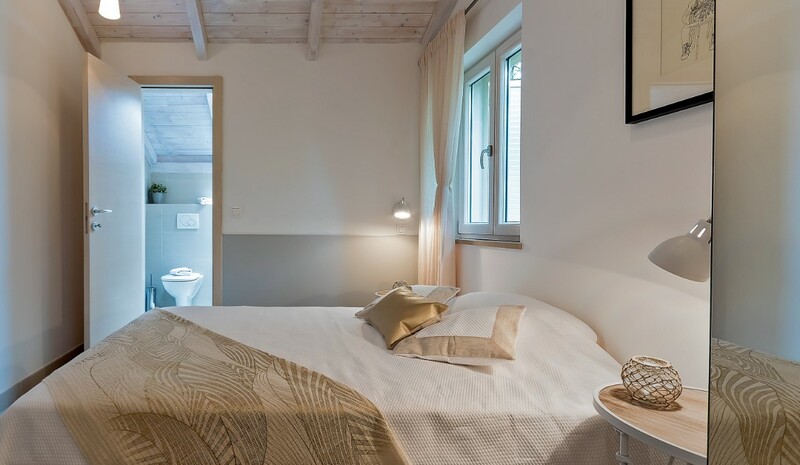 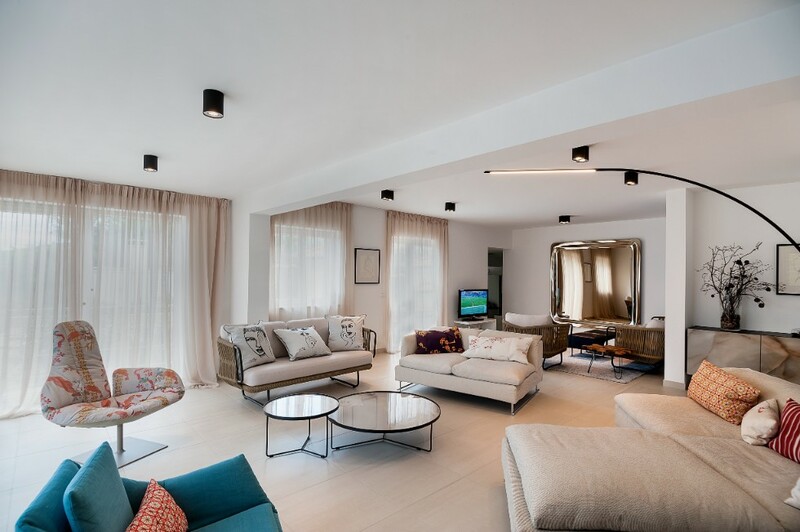 Recently renovated, Villa is one of the finest properties in the region, benefiting from direct access to the Adriatic sea. 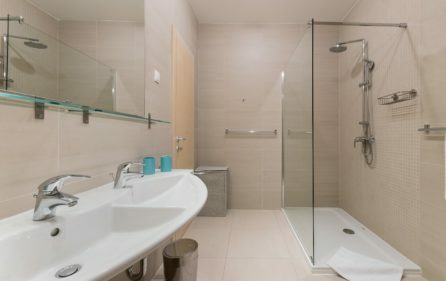 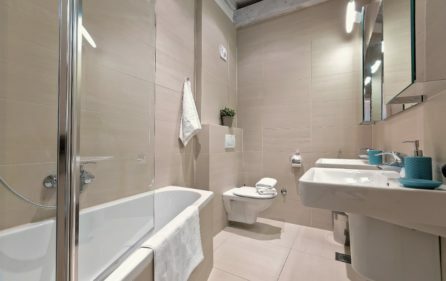 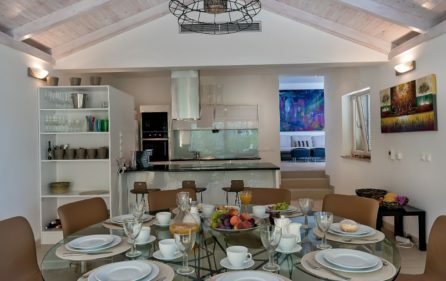 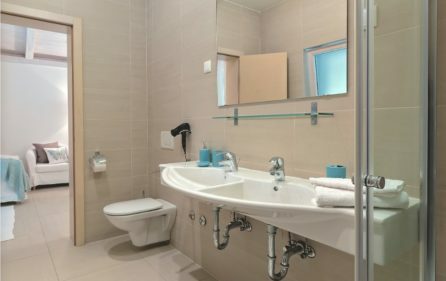 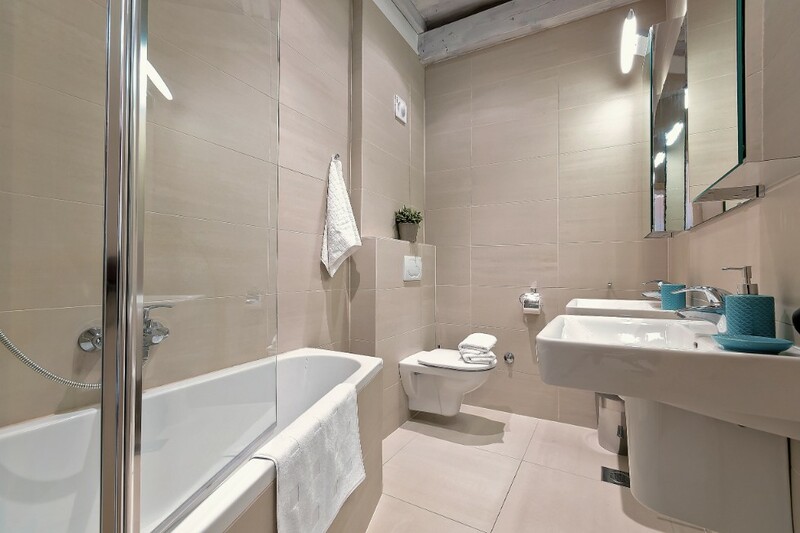 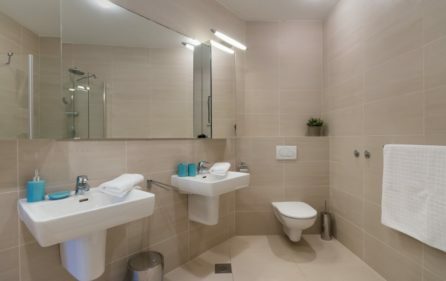 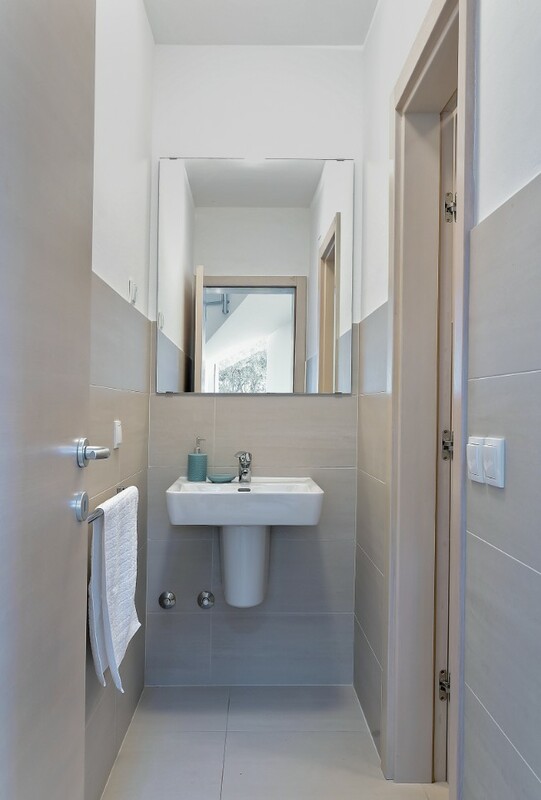 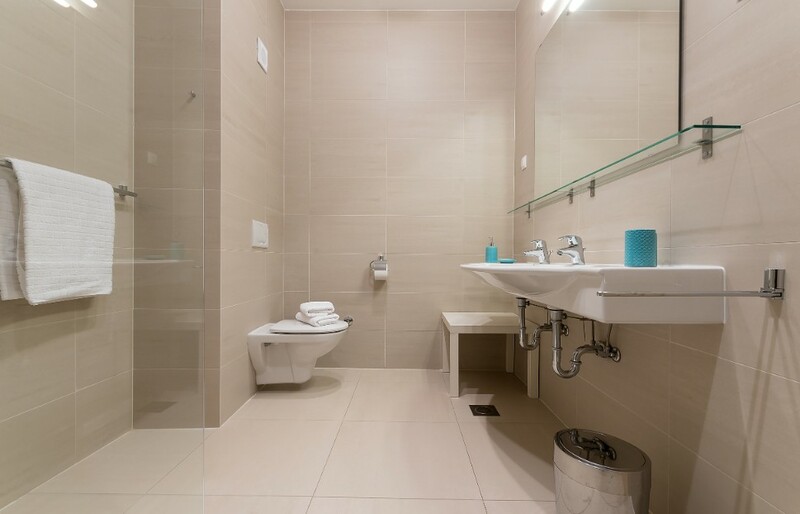 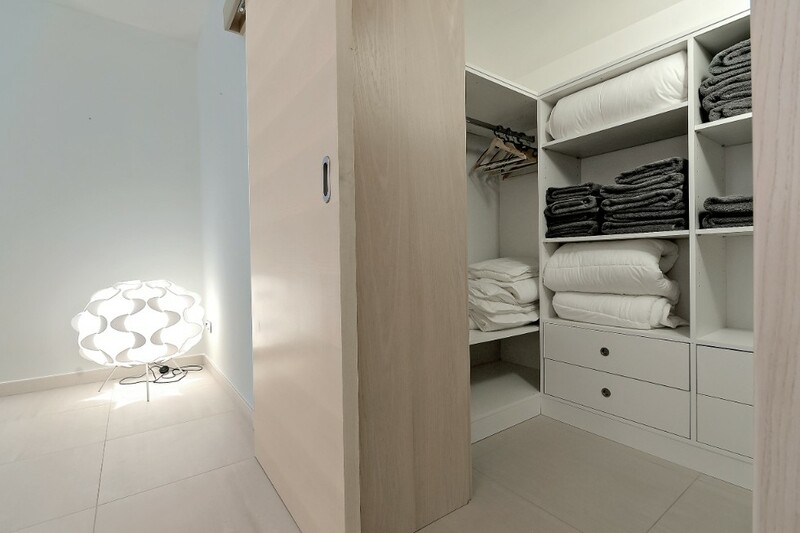 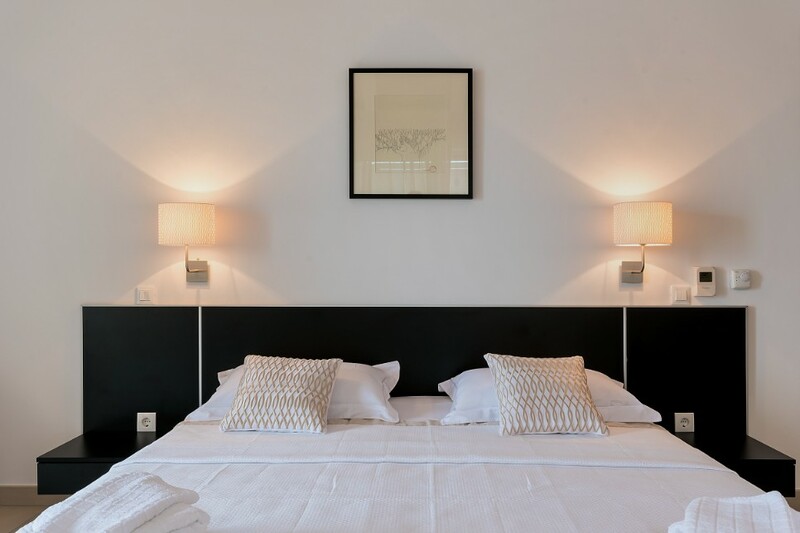 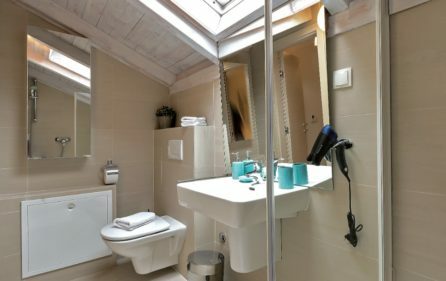 Each of the five bedrooms have en suite bathrooms, individually controlled air-conditioning and underfloor heating for winter rentals. 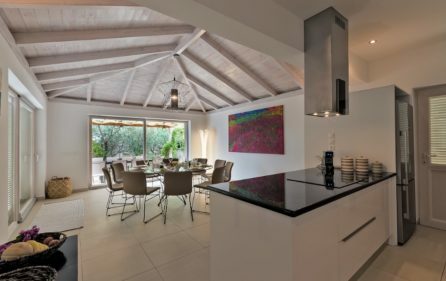 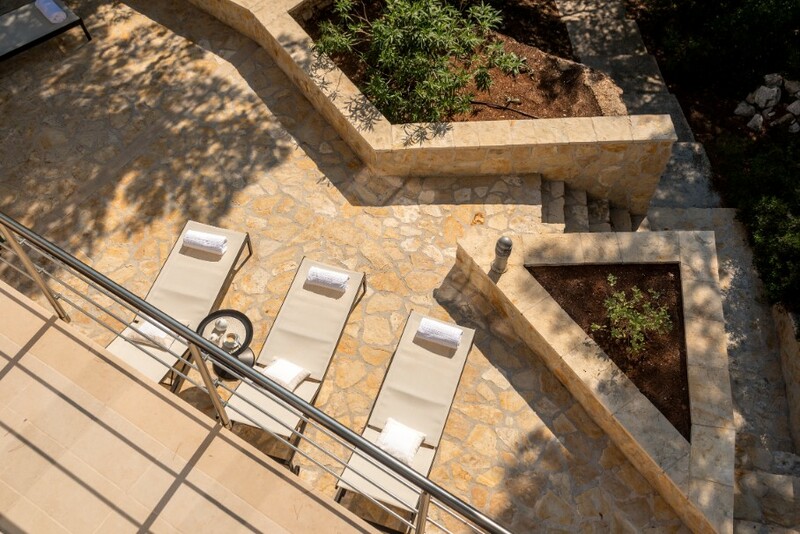 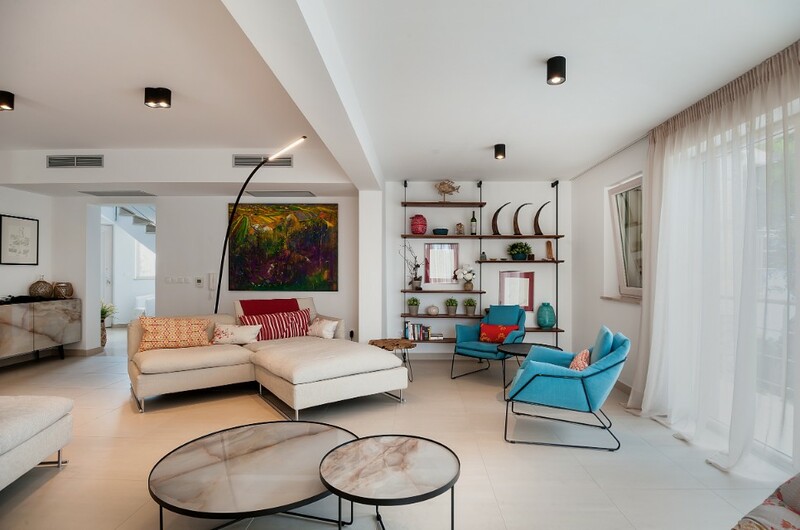 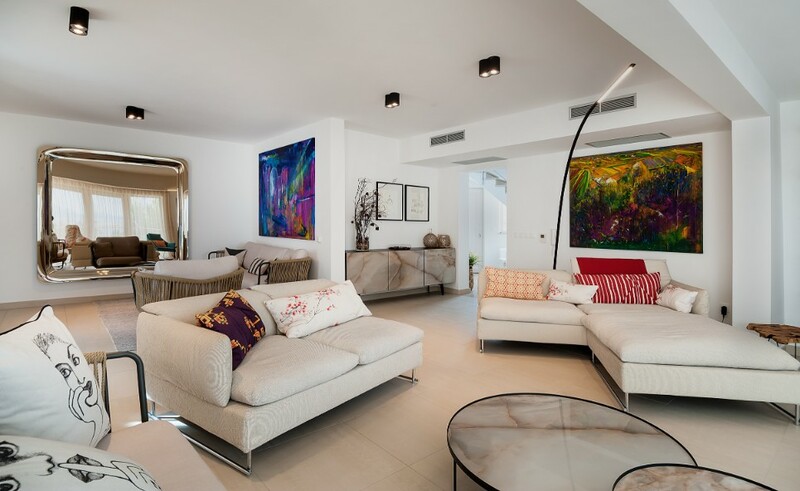 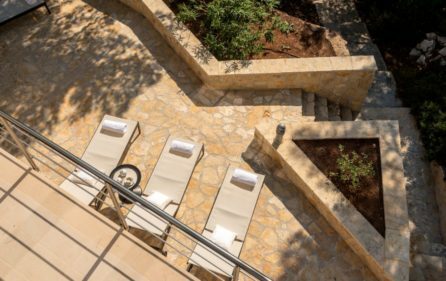 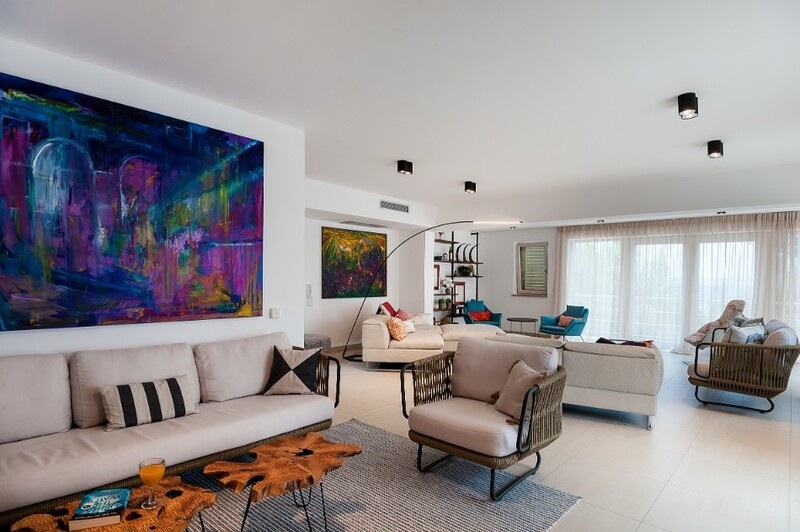 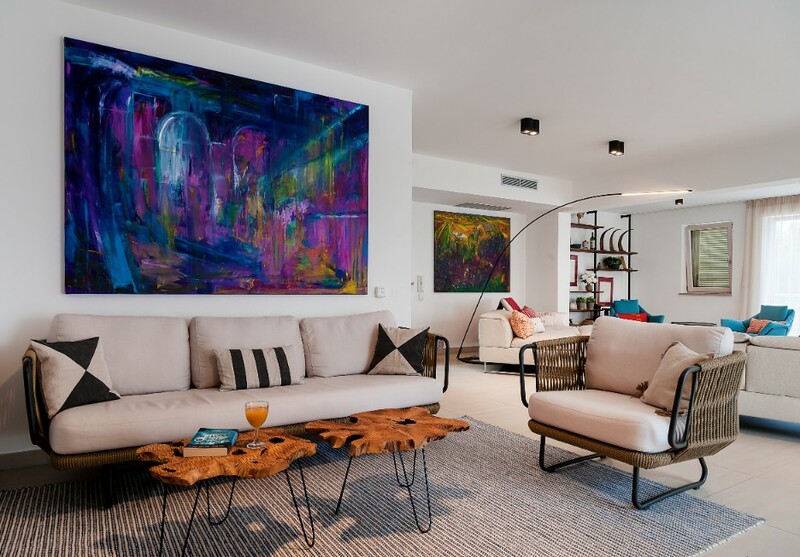 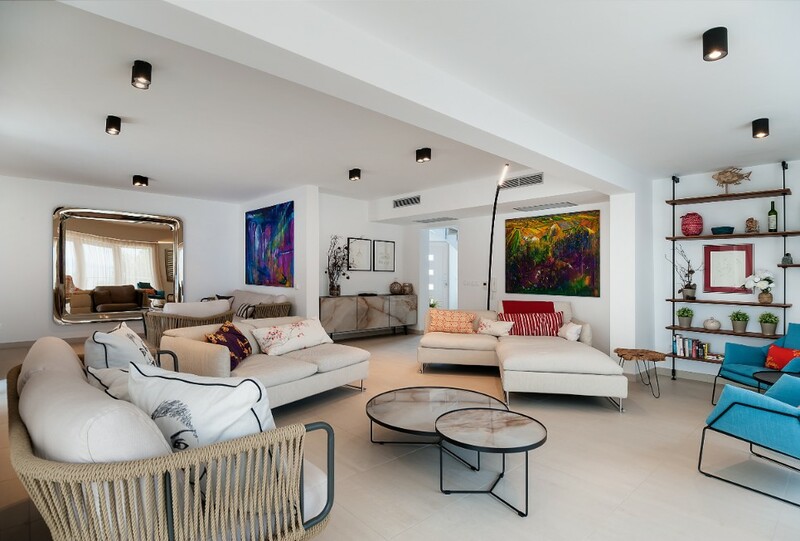 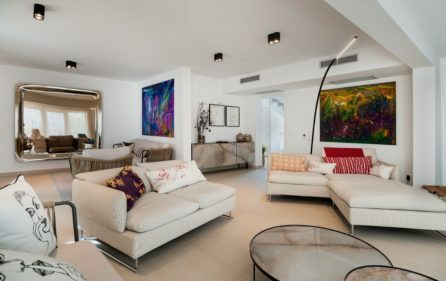 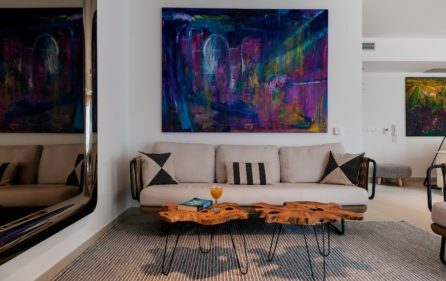 The living and dining areas overlook the private swimming pool and sun terrace, also benefiting from those glorious views. 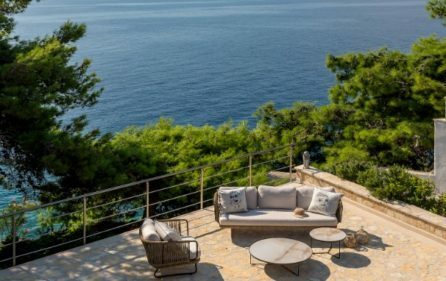 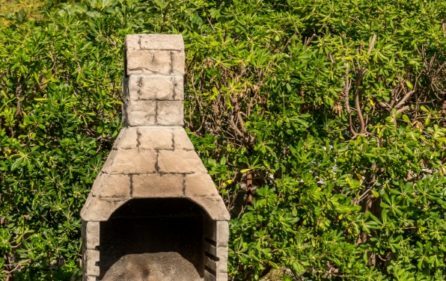 Here you have a true sense of a Mediterranean escape, with scents of the surrounding herbs and pine, olive, lemon and lime trees perfuming the private garden. 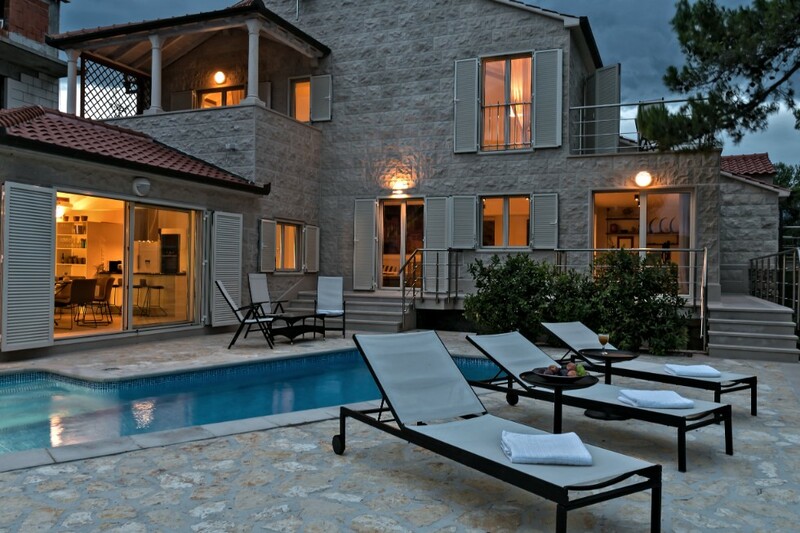 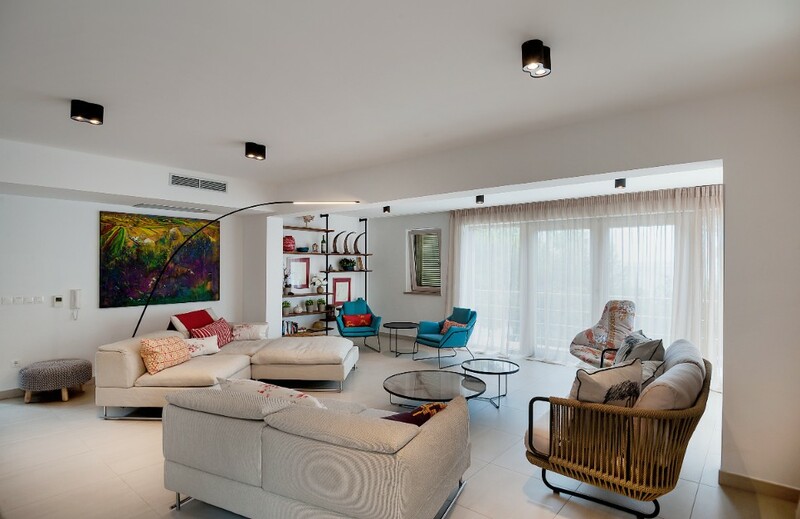 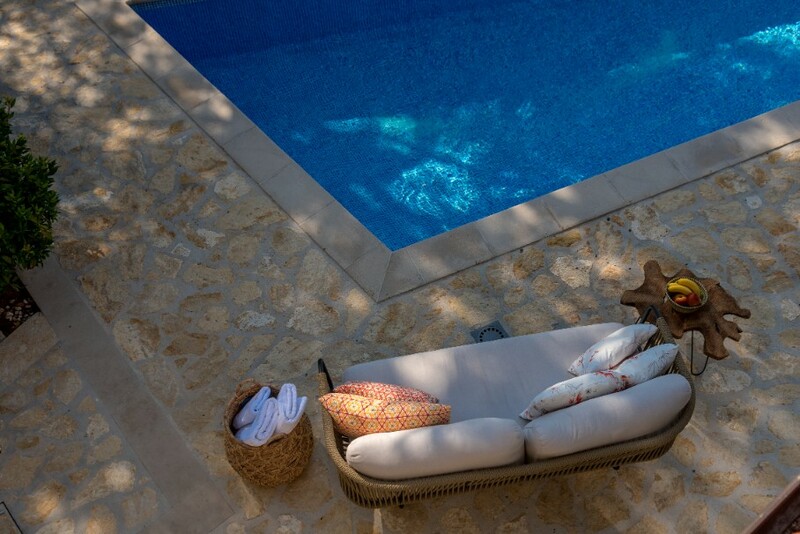 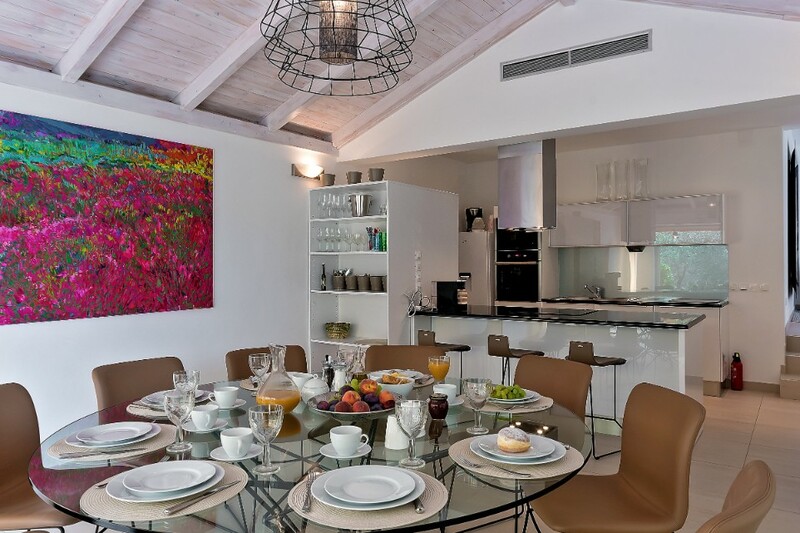 Villa can accommodate up to 12 people. 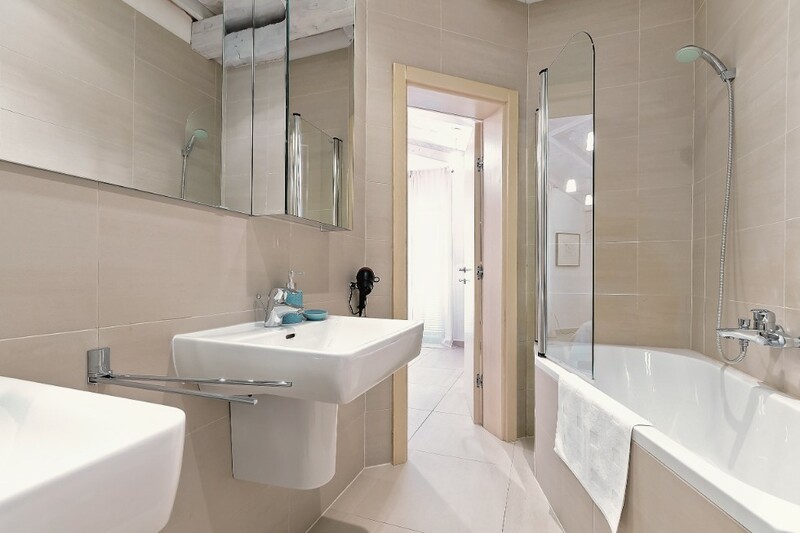 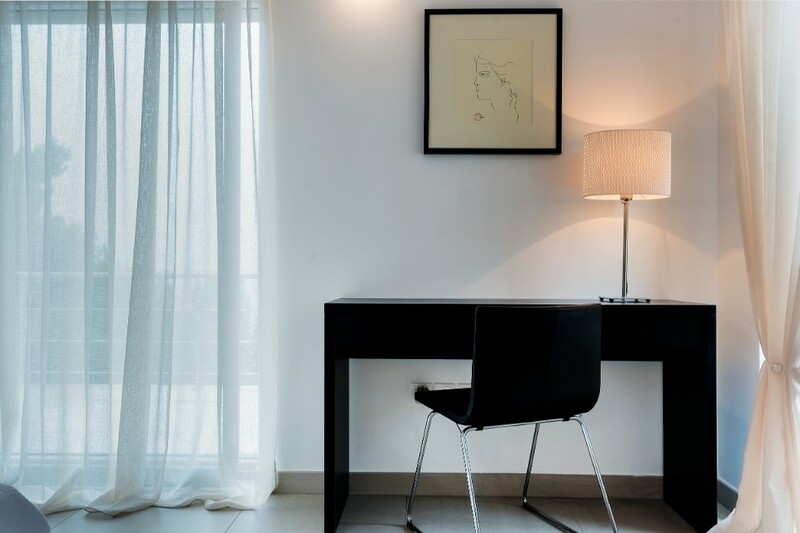 The daily service of a maid and the possibility of enhancing your staff with a cook allows extra pampering for guests. 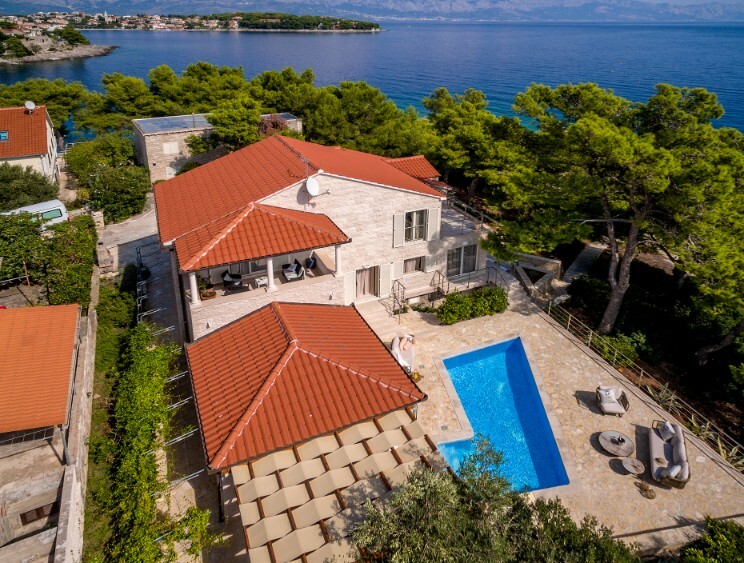 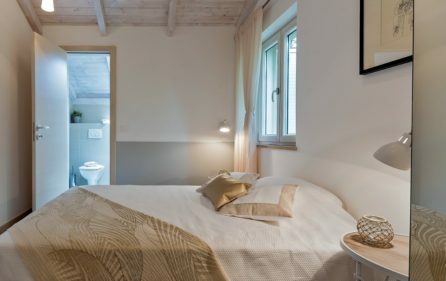 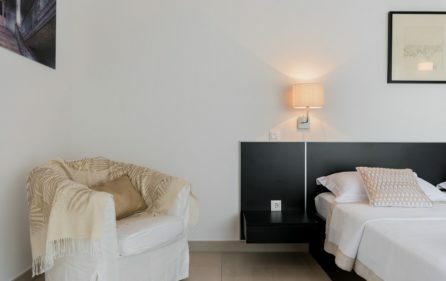 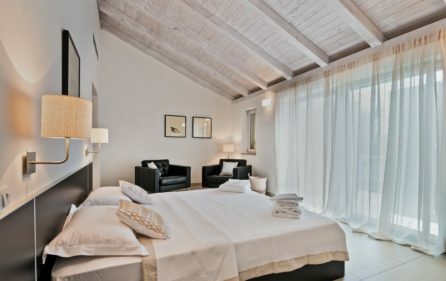 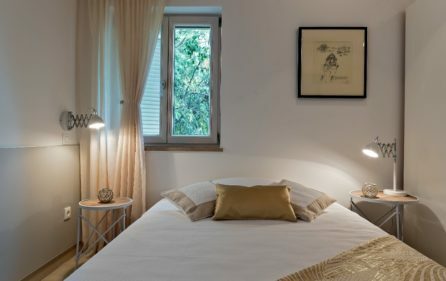 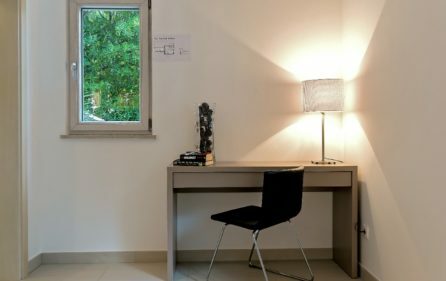 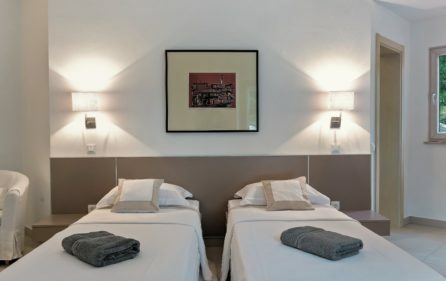 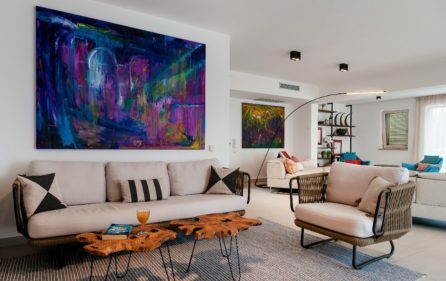 In addition, the fantastic house manager is available to ensure you get the most of your holiday; perhaps arranging for cultural visits to the ancient cities of Trogir and Split, or to charter the villa’s skippered 33 foot sailing yacht, allowing the discovery of wonderful secluded bays and island restaurants.